Complete ready to install, third-members. 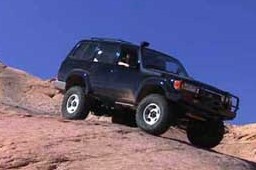 Applications for Land Cruisers and Pickups/4Runners. 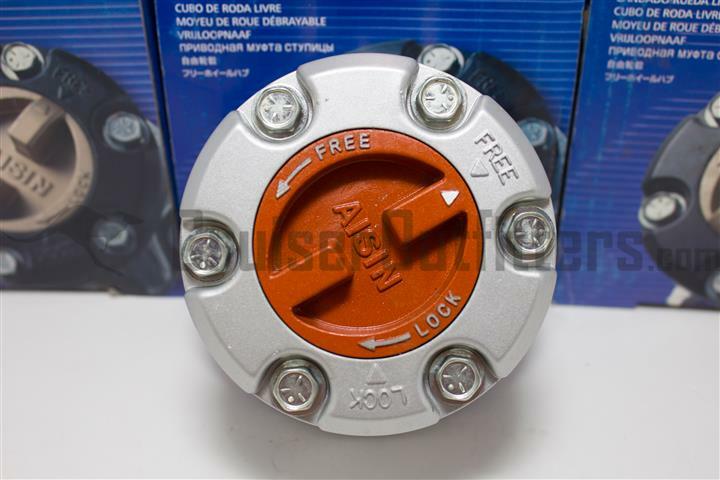 Available with ARB, Detroit, Lock Right, etc. Based upon availability of core differentials. Don't see your Toyota 4x4 application listed? Email the shop for availability and pricing. 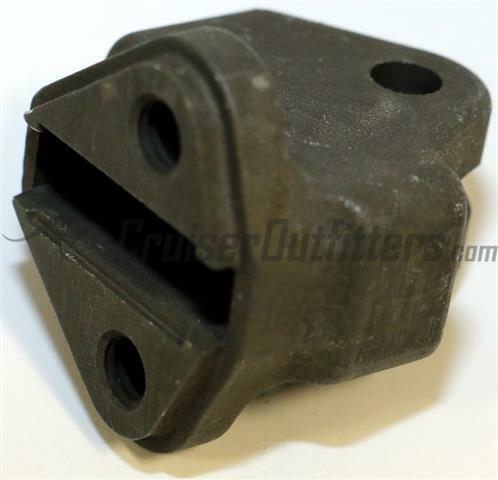 We stock components for the 4x/5x/6x/7x/8x/9x/10x/120/150/200 Land Cruisers & Tacoma, Tundra and 4Runner platforms. 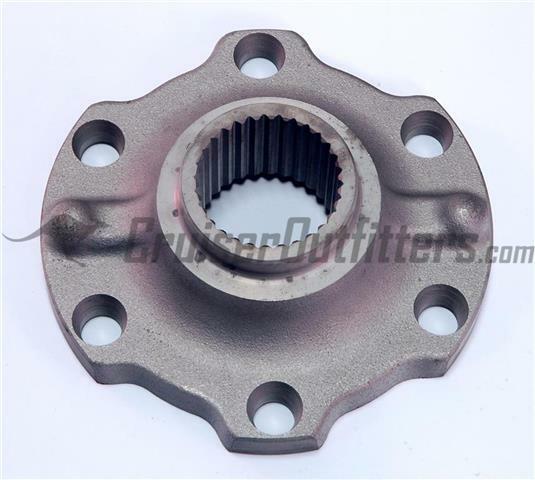 High quality reverse cut gears for you high-pinion front axle. 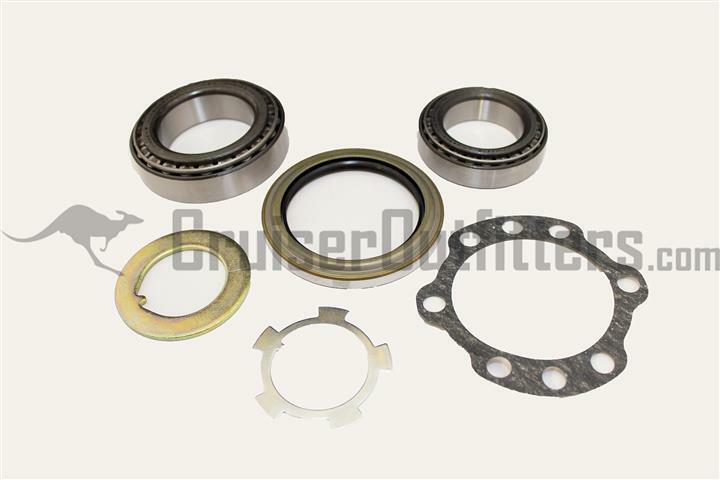 Kits included high quality Timken bearings unless otherwise specified. 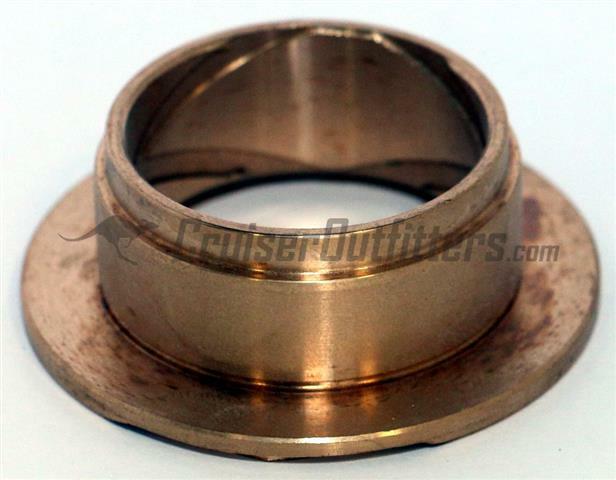 Timken is an OE Toyota supplier and we've used thousands of their bearings trouble free. 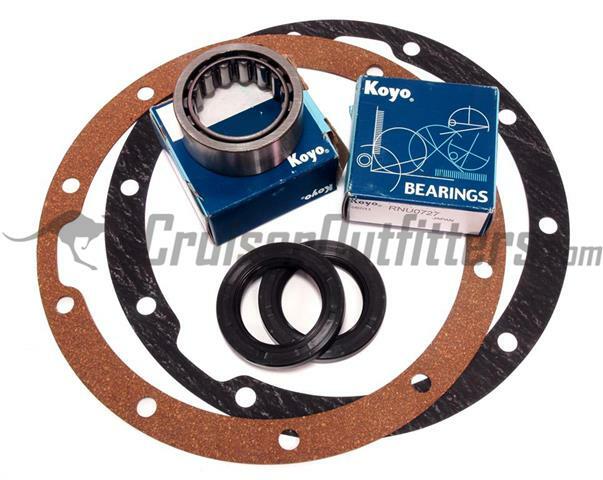 We do stock install kits featuring Koyo (Japanese) bearings, please call for more information. 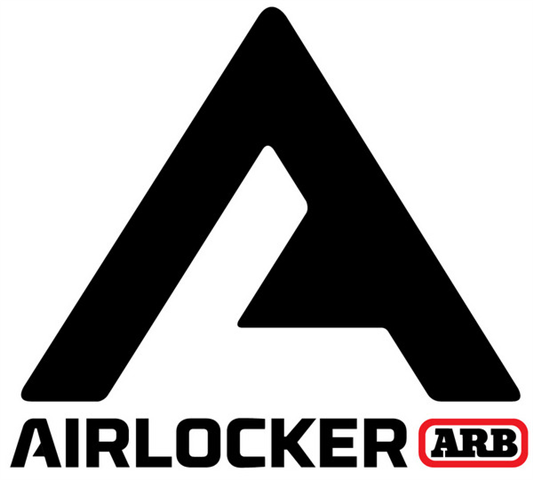 *ARB RD33, 124, 142 & 153 Air Lockers use 50mm ID carrier bearings, use IKTOYLCB. 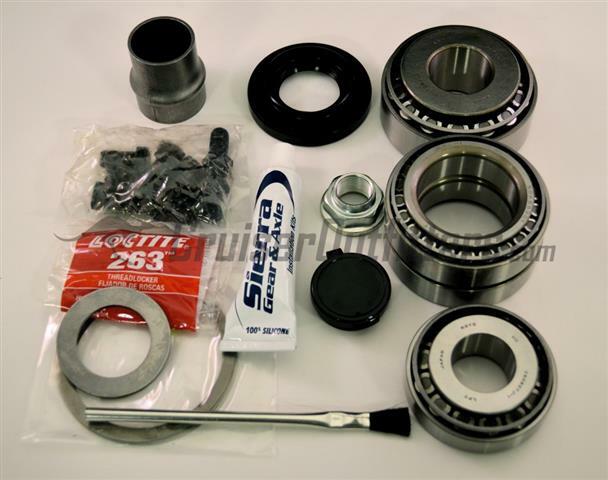 Kits include pinion bearings, pinion nut & seal, crush sleeve, shims, marking compound and silicone. 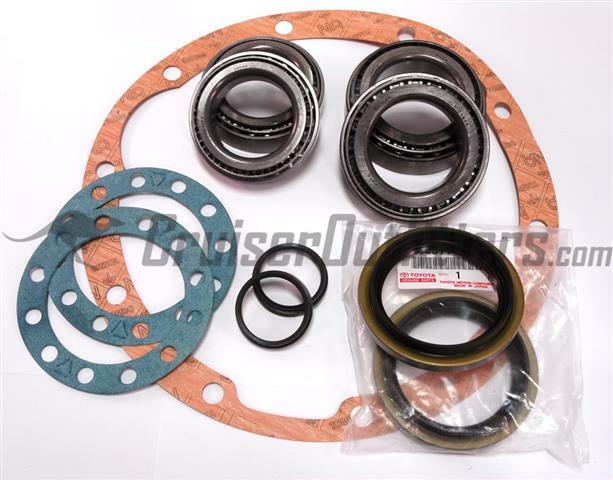 Kits included high quality Timken bearings unless otherwise specified. 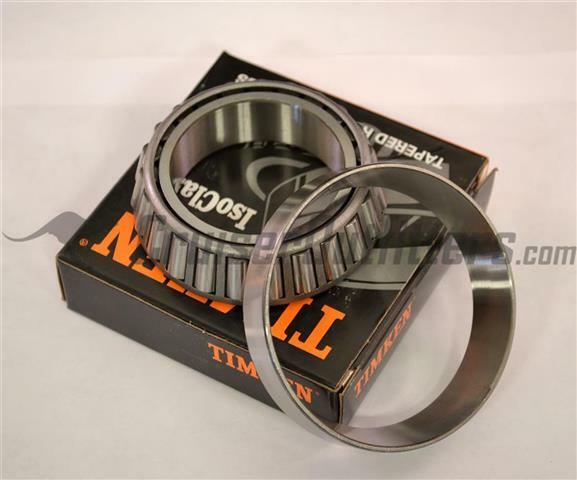 Timken is an OE Toyota supplier and we've used thousands of their bearings trouble free. 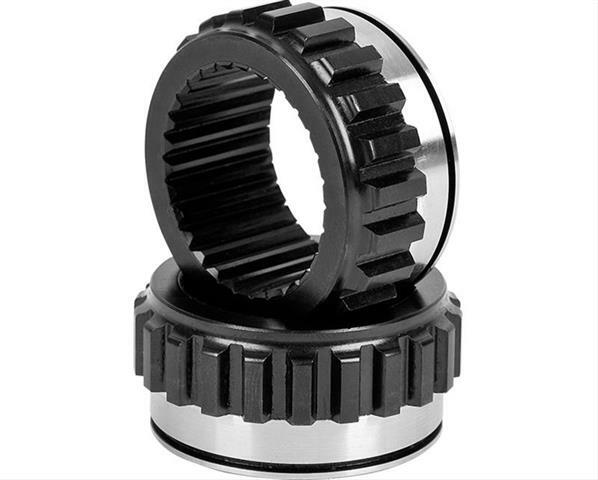 A must have for all ring and pinion or locker installs. 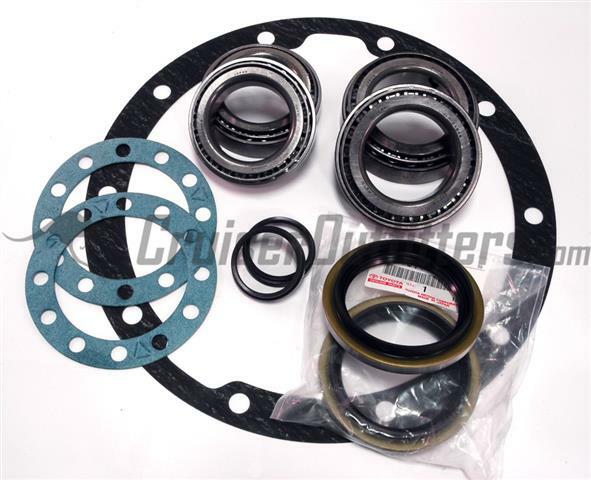 Pinion Install Kits NOT include carrier bearings, see full Ring & Pinion Install kits for kits including carrier bearings. 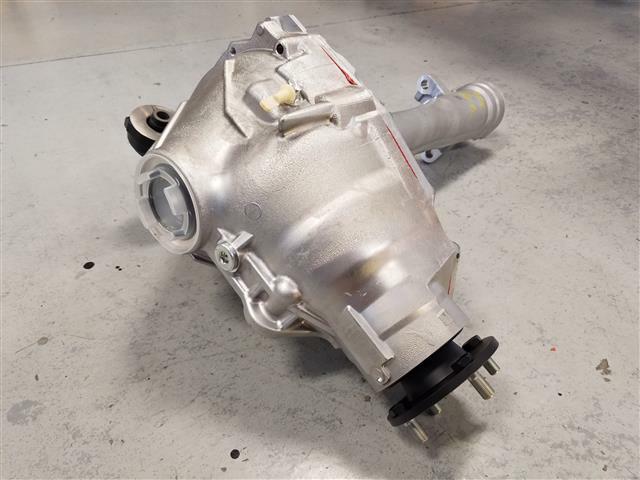 FAQ: What parts do I need for a re-gear or differential overhaul on my Toyota? 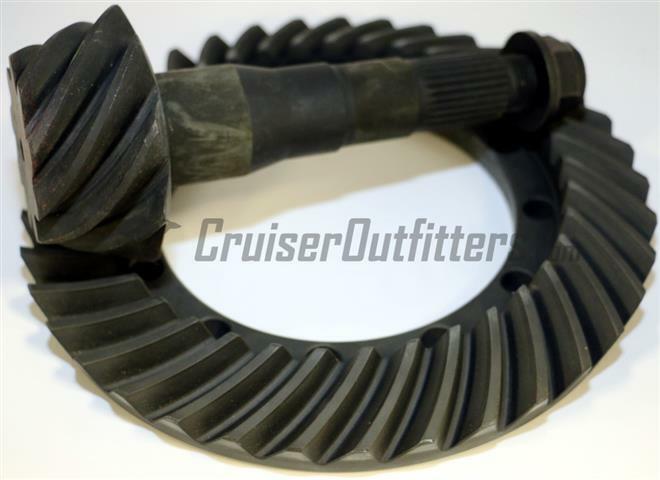 For use with thru-bolt style ring-gears, 12 required per axle. Pre 1969 axle will require an updated ring-gear and carrier assembly. 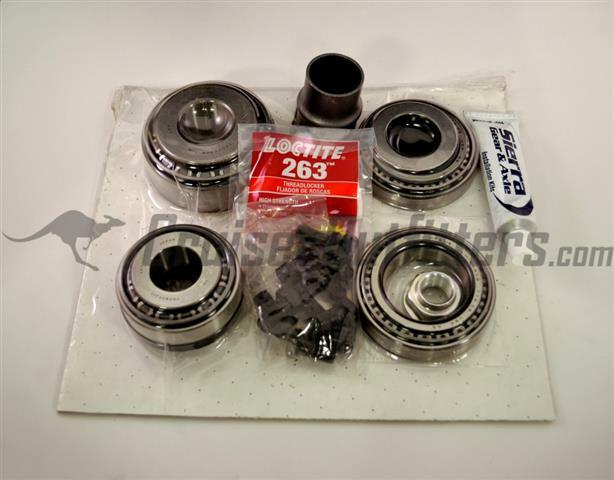 Includes the FA7590 components plus wheel bearings. One required per vehicle. Please choose desired brand of bearing. 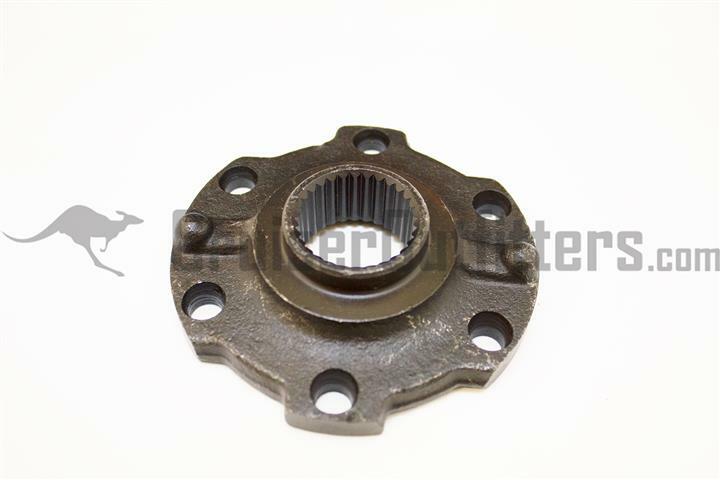 Toyota solid front axle knuckle rebuild kits, one required per axle. 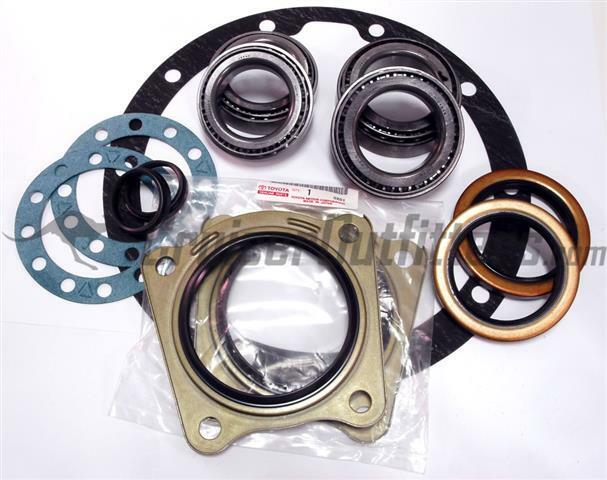 Includes seals, gaskets, felt/rubber wipers, wiper backing plates, shims, lock washers and Koyo trunnion/knuckle bearings. One required per vehicle. Includes the FA7X97 components plus wheel bearings. One required per vehicle. Please choose desired brand of bearing. 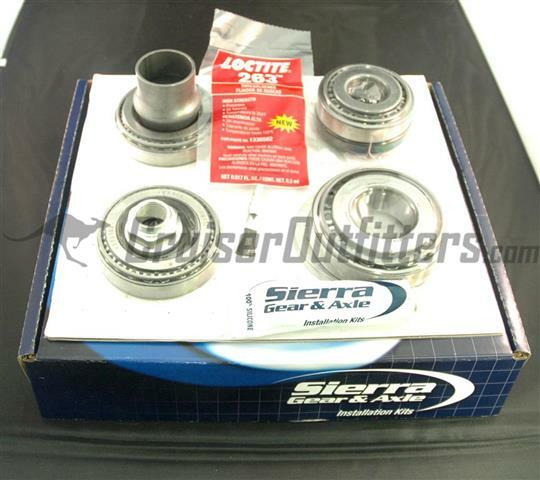 Toyota solid front axle knuckle rebuild kits, one required per axle. 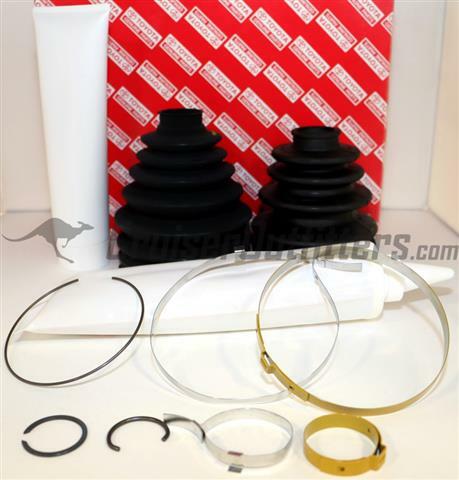 Includes seals, gaskets, felt/rubber wipers, wiper backing plates, lock washers and Koyo trunnion/knuckle bearings. 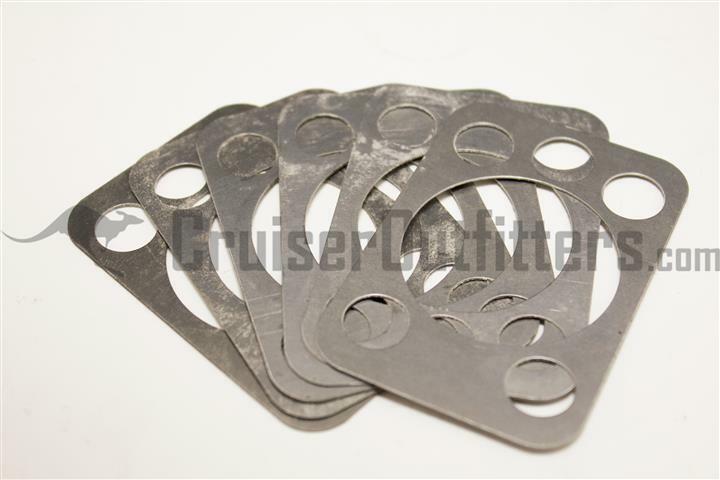 Replacement shims are not required on 80 Series axles. One required per vehicle. 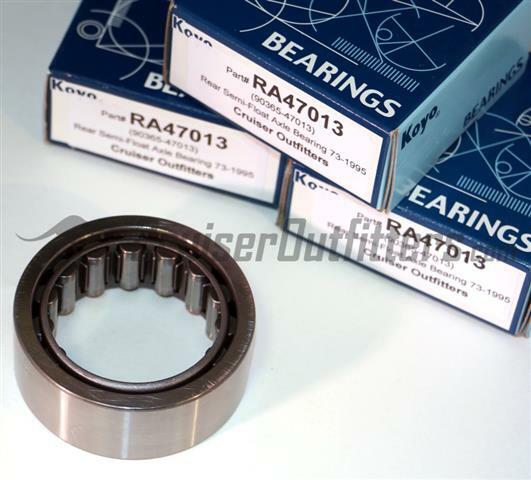 Includes the FA9097 components plus wheel bearings. One required per vehicle. 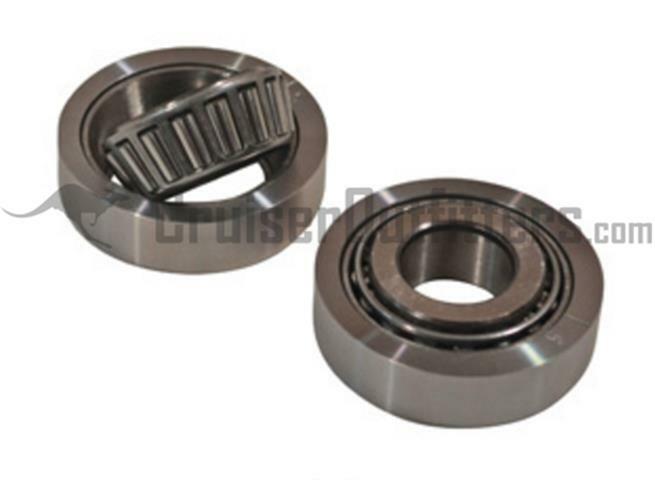 Please choose desired brand of bearing. 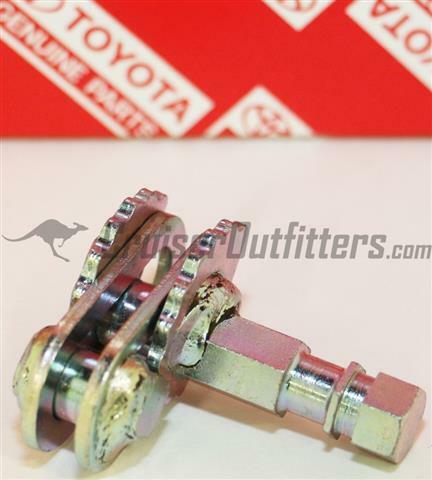 Toyota solid front axle knuckle rebuild kits, one required per axle. 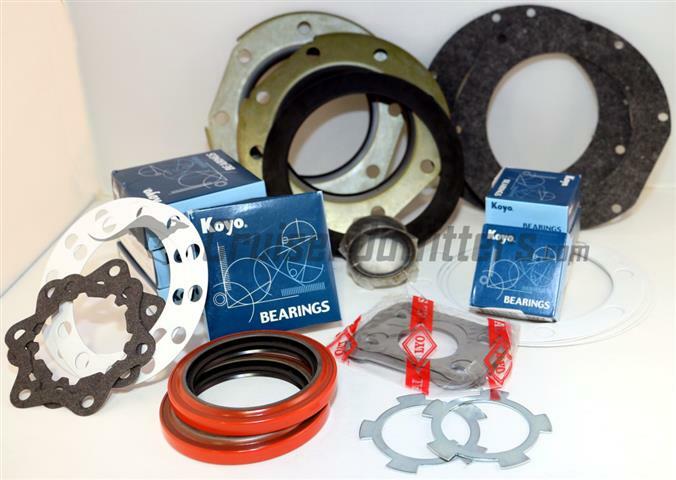 Includes seals, gaskets, felt/rubber wipers, wiper backing plates, lock washers and Koyo trunnion/knuckle bearings. 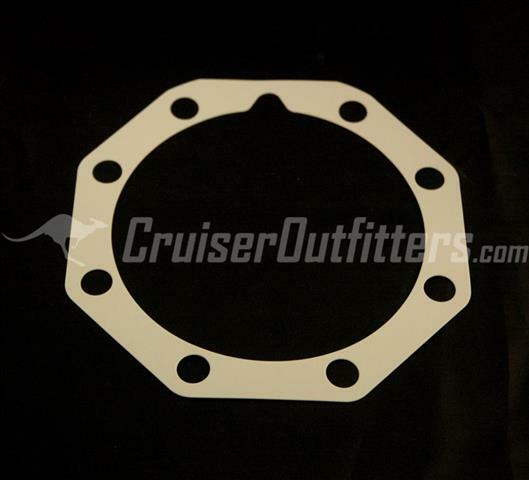 Replacement shims are not required on 07+ 7x Series axles. One required per vehicle. 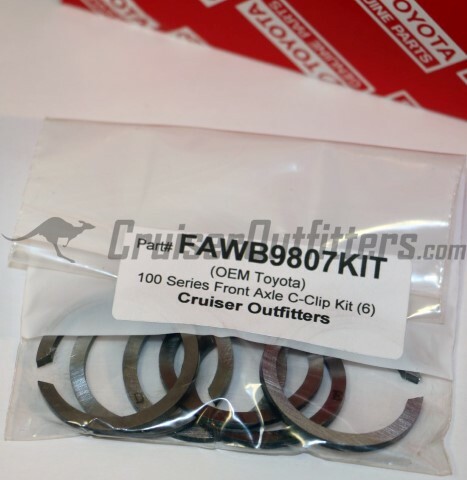 Includes the FA9807 components plus wheel bearings. One required per vehicle. Please choose desired brand of bearing. 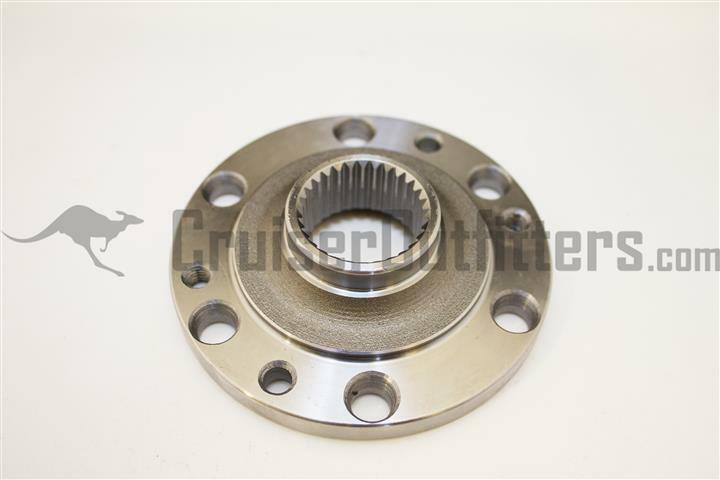 Includes the FA0717 components plus wheel bearings. One required per vehicle. 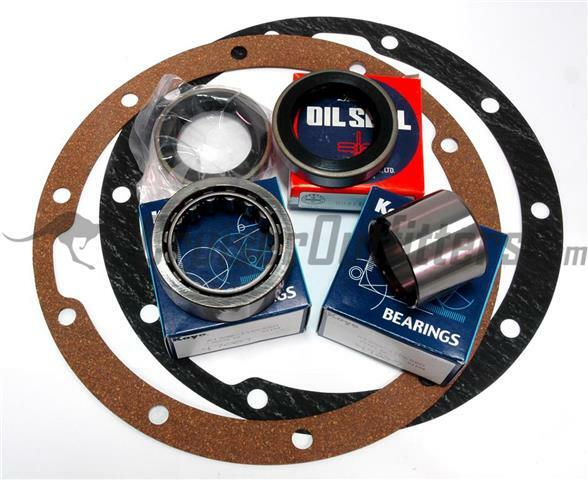 Please choose desired brand of bearing. FAQ: Timken versus Koyo wheel bearings? Which is better? 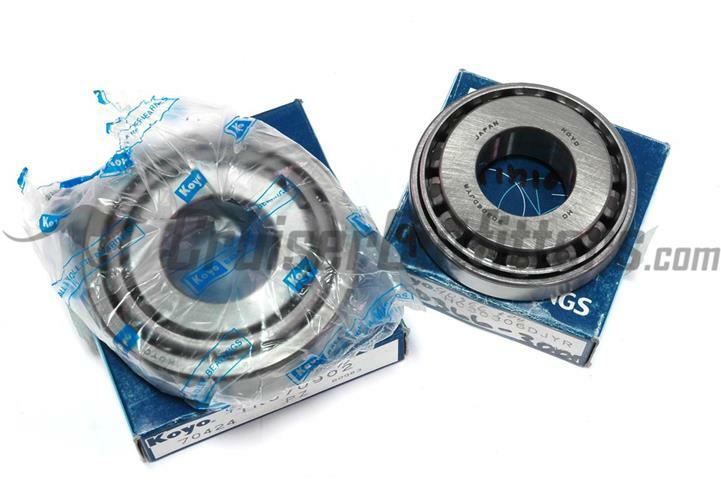 Both are a fantastic bearing and due to customer demand for both options we stock them both. 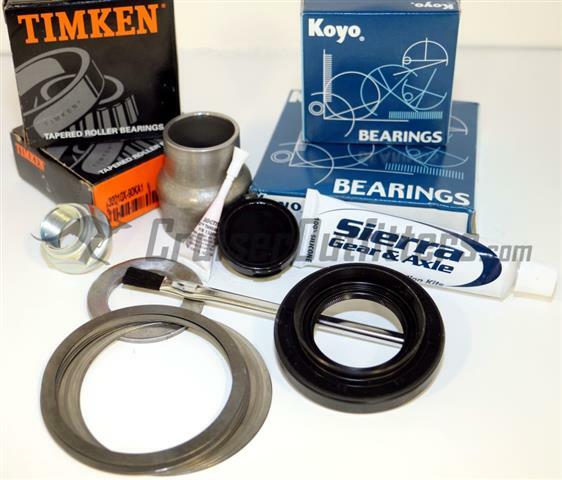 Timken bearings are made in the USA, Koyo bearings are made in Japan. 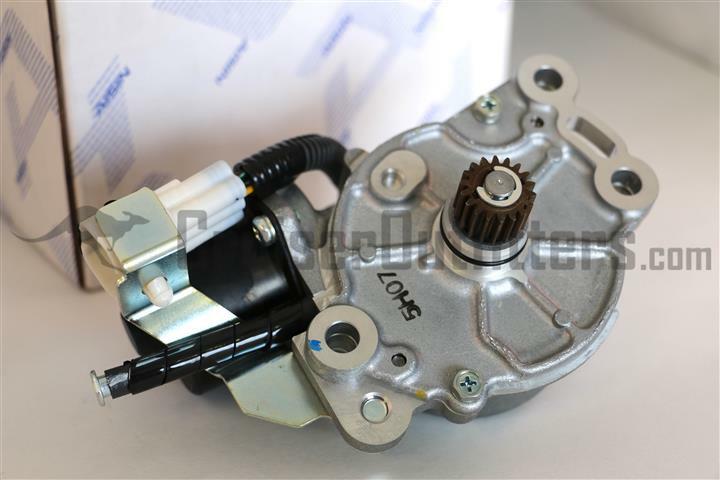 Both are used OEM by Toyota in older Land Cruisers and various new models as well. We are 100% confident in either option for new and old Land Cruisers alike. 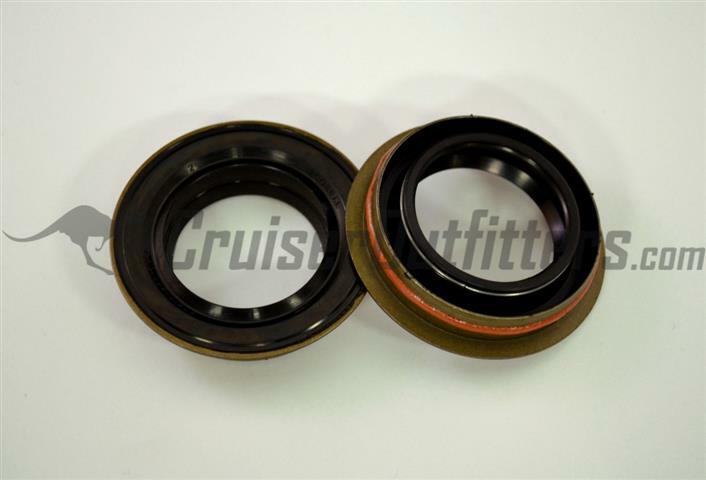 FAQ: Upgraded heavy duty inner axle seals? 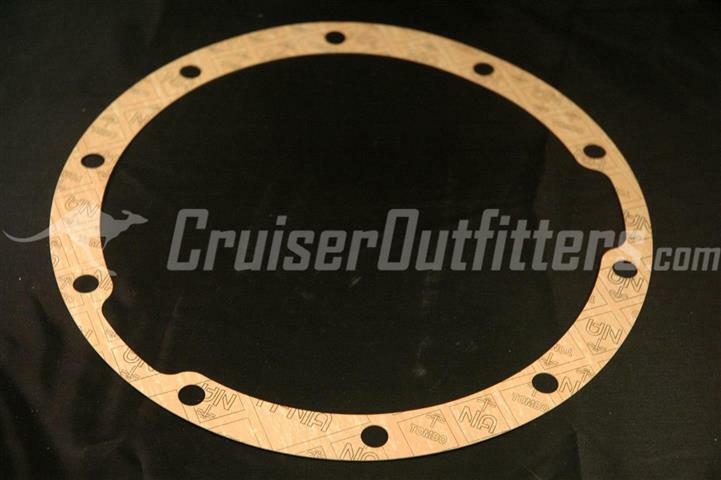 All of our knuckle overhaul kits include the standard stock style seal (Part# FA33085 and FA35010 below). 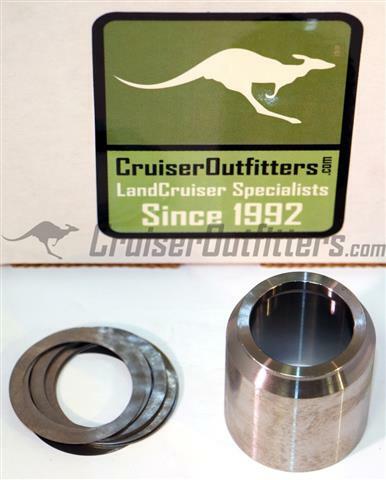 If your looking for a heavy duty option due to extreme turn angles, worn seal surfaces on your inner axles or slightly untrue axle housings, Cruiser Outfitters stocks the Marlin Crawler Heavy Duty Eco Seal for all 1969-1997 Land Cruiser axles. See Part# FA33085MA and FA35010MA below. 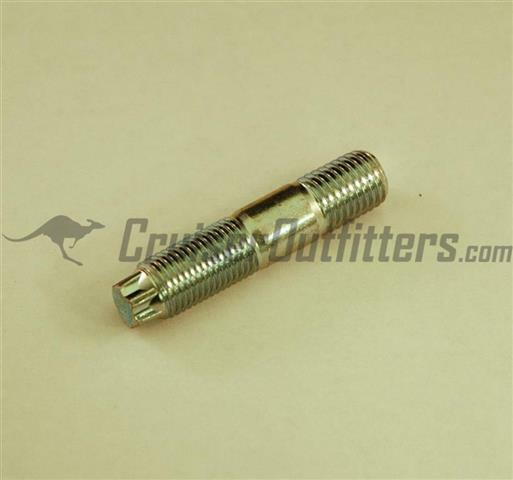 Purchase two for your axle overhaul. 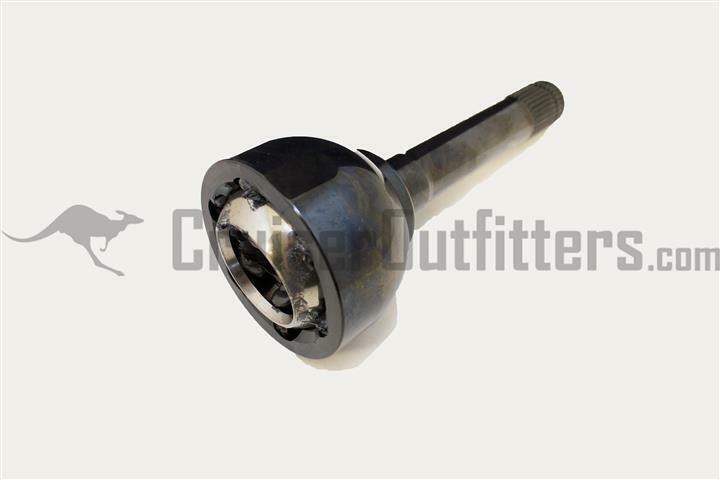 Are you Planning to overhaul/replace or switch your birfield (outer axle joint) from one side to the other? 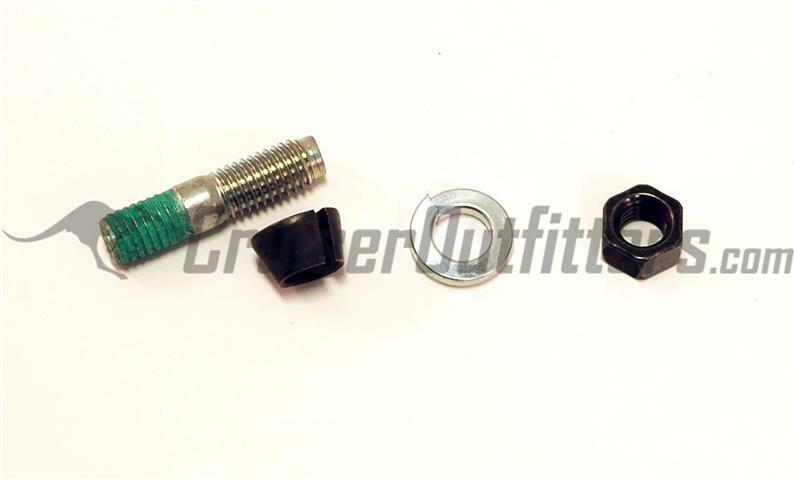 If so, you will want to make sure to have the axle clips that go inside of the birf, they often break when removing the inner axle from the birf. See part# FACL27091 & FACL34005 below for your application. 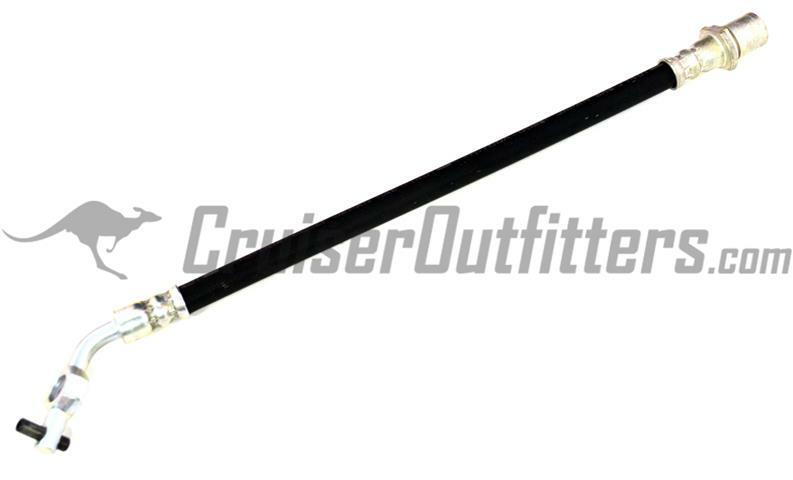 Order 2 per axle. 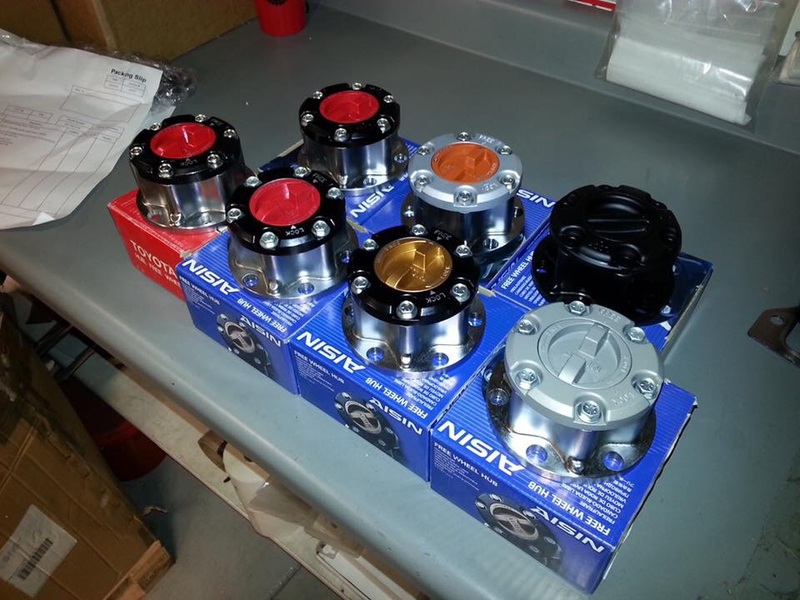 Rebuilding Your Stock Aisin/Asco Hubs? Are you planning to completely disassemble and overhaul your Aisin hubs? Fortunately they are very simple and contain only a few consumable parts. 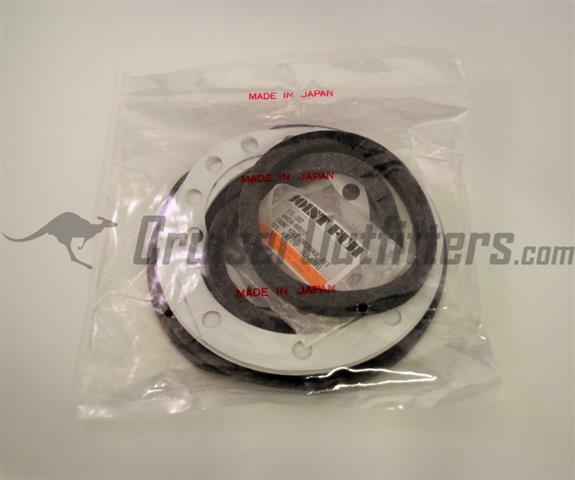 Plan on 2 of the Aisin dial 0-Rings (Part# HUB060010) and also consider replacing your worn hub dial detent spring and ball (Part# HUBDETENT), 1 kit required per hub. 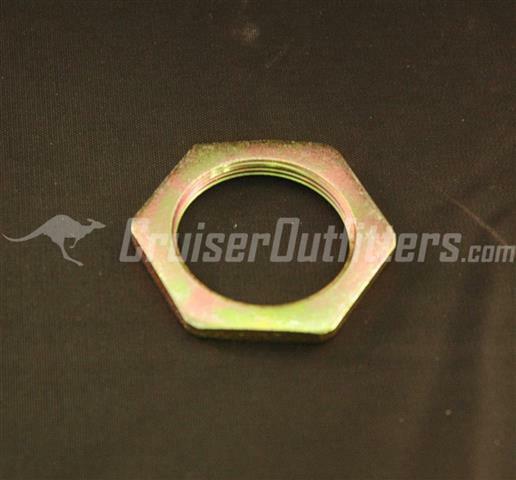 If you need addition hub parts such as studs, cone washers or dial bolts, see our Aisin Hub Parts listing below. What tools will you need to complete the job? 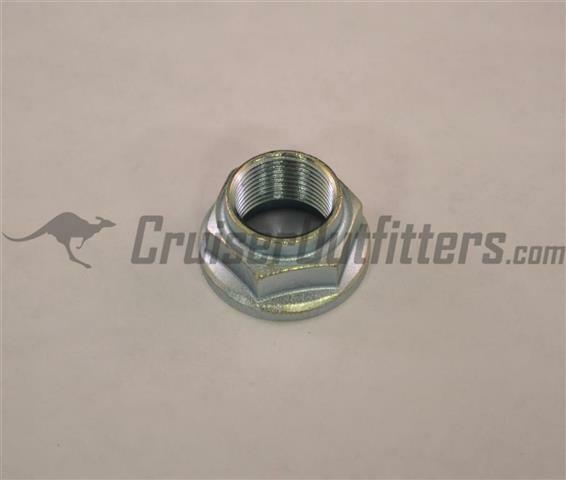 At a minimum you will want to have a 50mm hub socket (part# FA301038 fits E-9/1975 drum brake axles) or a 54mm hub socket (part# FA15007 fits all 9/1975-2007 disc brake axles) for your Land Cruiser axle work. Additionally you will need basic hand tools, a brass drift and a spring-scale gauge (Part# FASCALE) and snap ring pliers (Part# FASNAP). 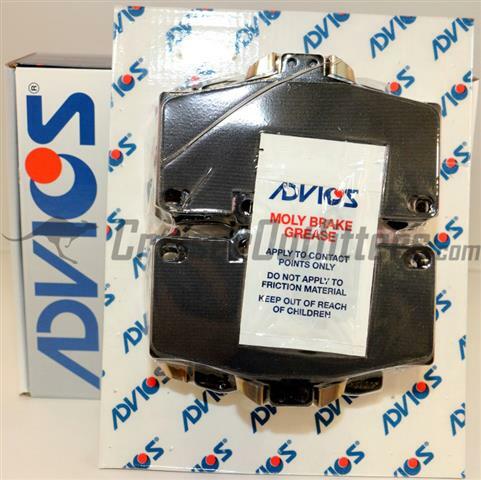 These additional items are all easy to source at your local auto parts store. Looking for more information on the rebuild process? 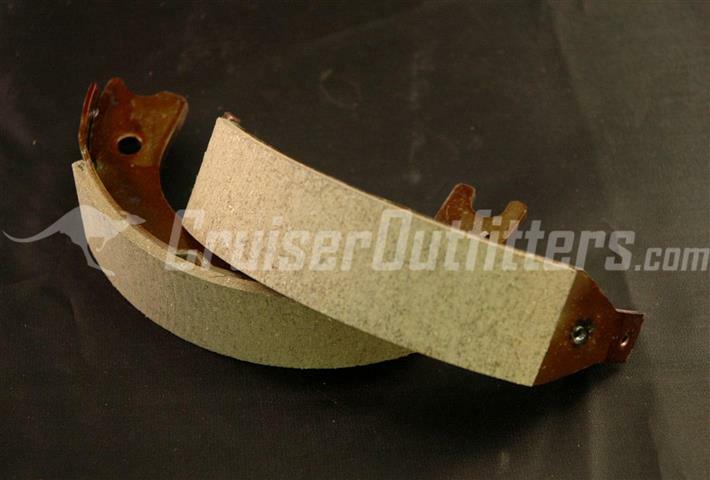 Replace your worn or broken birfield joints with these stock duty replacement options. Two required per axle. Replaces your worn or broken birfield joint. 4340 chromoly, larger housing and redesigned internal parts for additional strength. Joint is cryo and heat treated. Two required per axle. 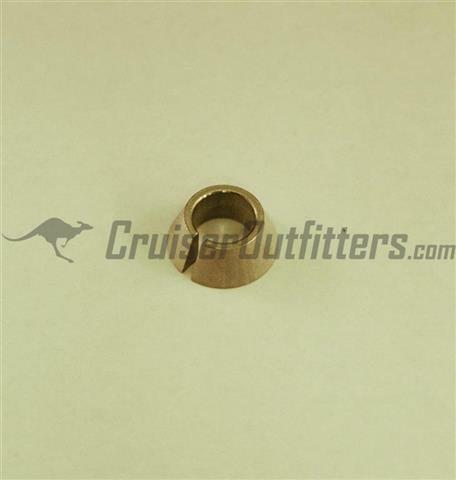 Order Part# TG3032491 for replacement ABS tone ring. Requires re-use of ABS tone ring from existing birf. 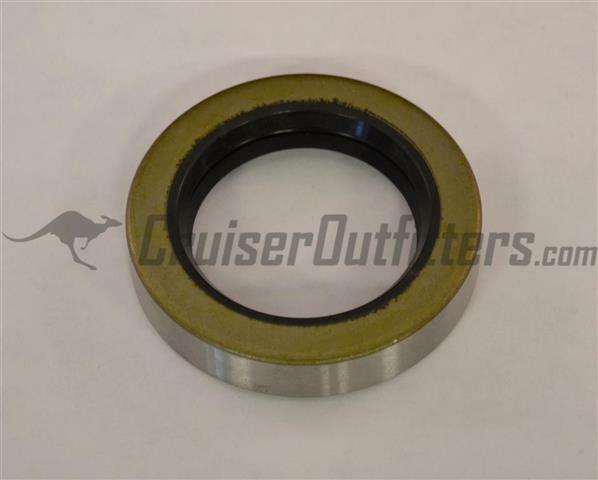 Features 24 spline's inside the birf joint for use with stock inner axle shafts & dual snap ring grooves for use on all 80 Series models) Order Part# TG3032491 for replacement ABS tone ring. 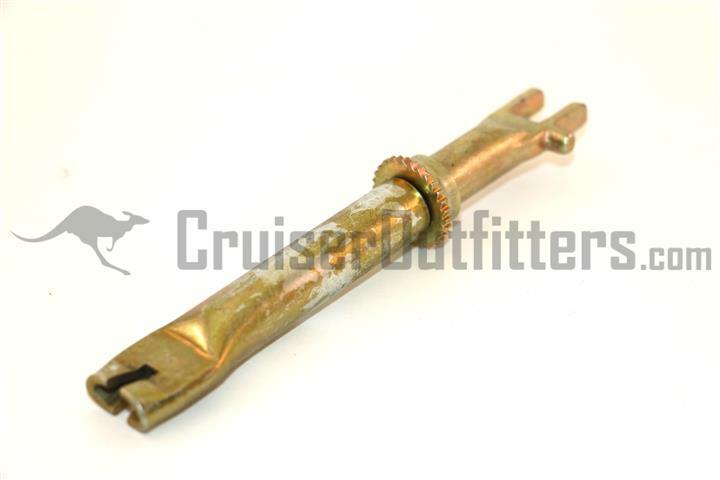 Replaces your worn or broken birfield joint. 4340 chromoly, larger housing and redesigned internal parts for additional strength. Joint is cryo and heat treated. Two required per axle. Gun drilled for ease of maintenance. 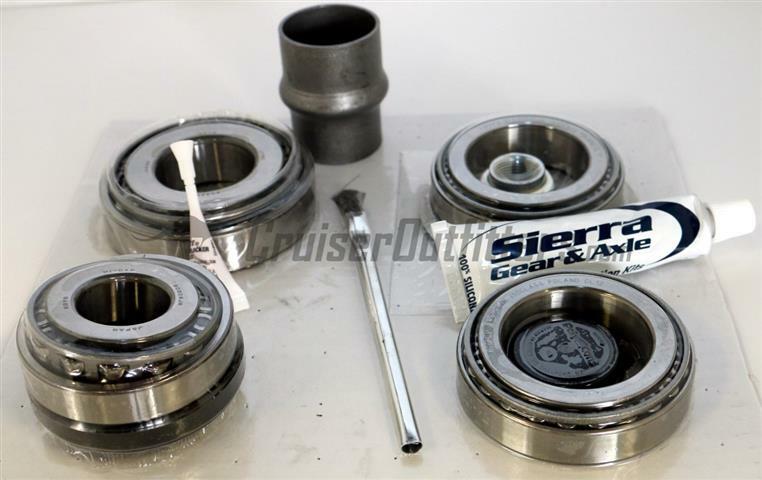 Features 24 spline's inside the birf joint for use with stock inner axle shafts & dual snap ring grooves for use on all 80 Series models) Order Part# TG3032491 for replacement ABS tone ring. Axle kits feature 30 spline axles at both ends, an upgrade over the 27 spline's found in stock applications. 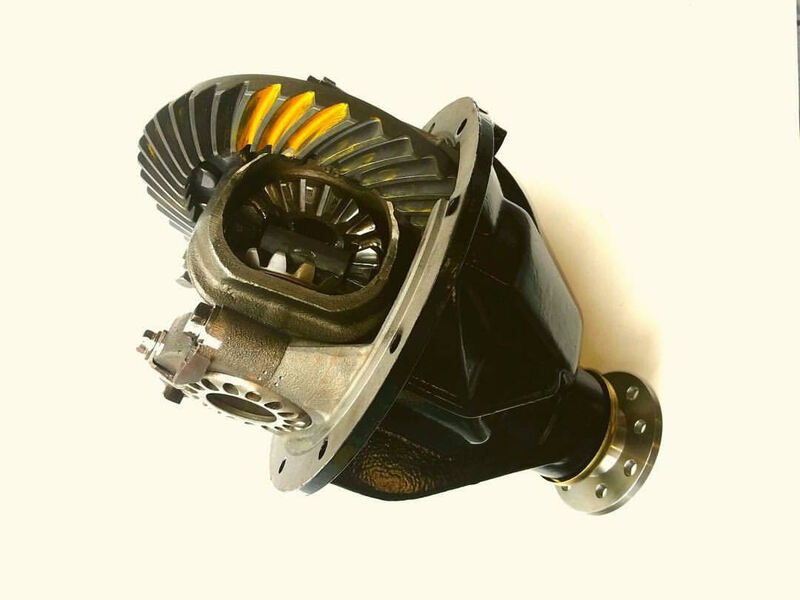 Kits are fully compatible with stock differential components, housing and hubs. Components feature high strength chromoly material, heat-treating and polishing for uniformity and ultimate strength. One kit required per vehicle. Requires re-use of ABS tone rings from existing birf. Nitro 80 kits feature the "Big 24" splines inside of the birfield joint & dual snap ring grooves for use on all 80 Series models. 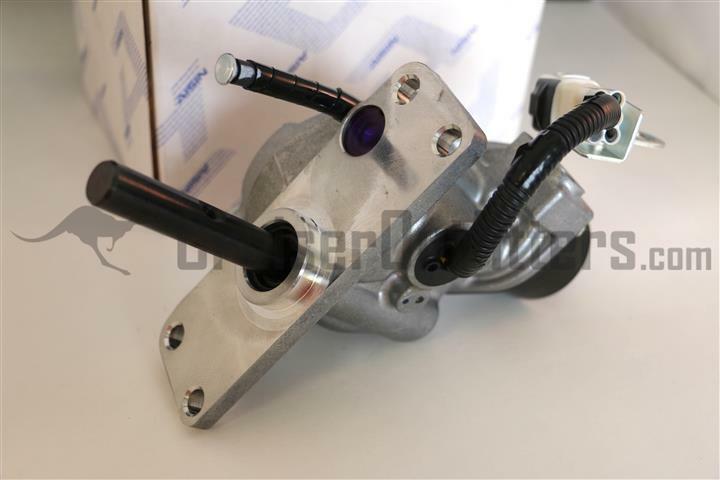 Kits are fully compatible with stock differential components, housing and hubs. 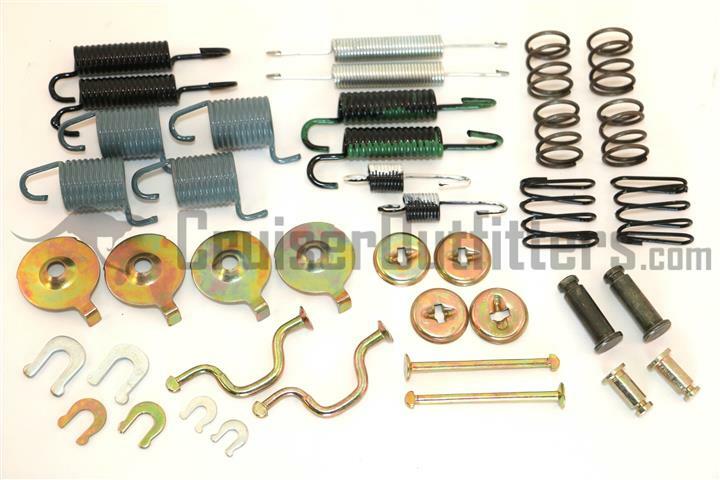 Components feature high strength chromoly material, heat-treating and polishing for uniformity and ultimate strength. One kit required per vehicle. Requires re-use of ABS tone rings from existing birf. This RCV kits features the upgraded 30 splines inside of the birfield joint & dual snap ring grooves for use on all 80 Series models. 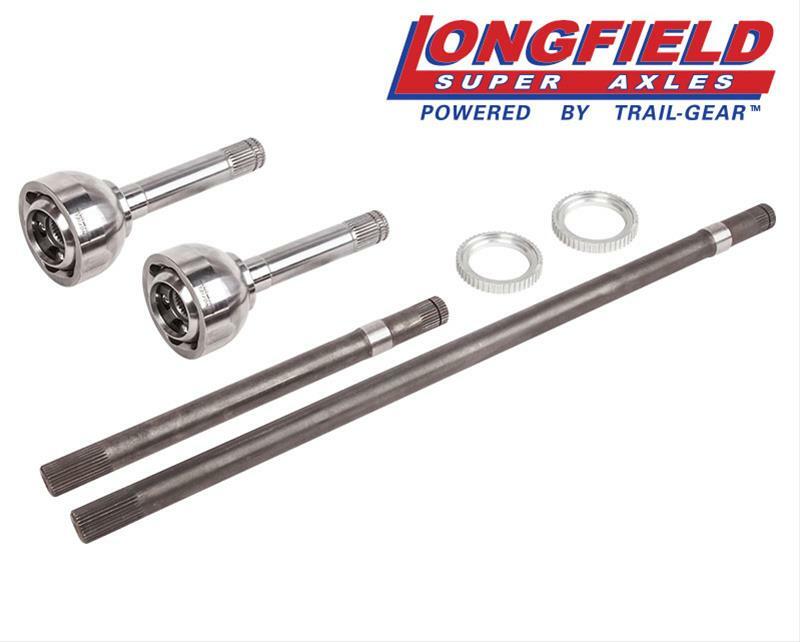 Longfield 80 Series Gun Drilled 30-Spline Super Set. 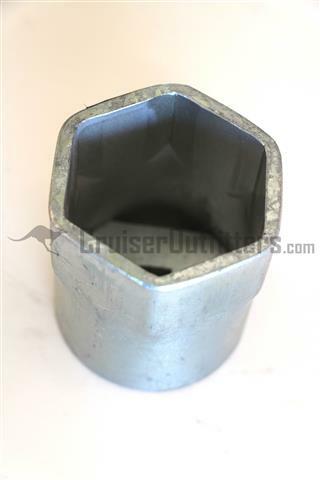 Made out of 100% chromoly and are precision polished to remove any imperfections that may cause stress risers. The internals of the birfield are also made from 4340 chromoly and are dual heat treated for superior strength. The birfield has a M8 grease zerk at the end of the stub shaft and is gun drilled through the center of the birfield to allow for grease to pass through the zerk fitting and into the internals. 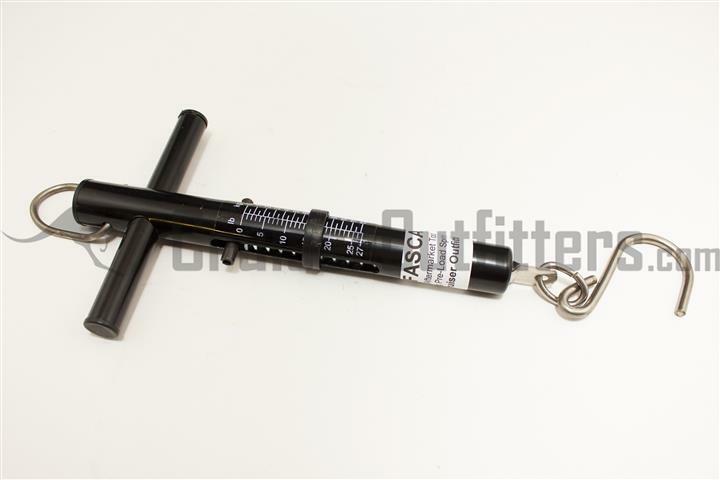 This will save you precious time by eliminating the need to disassemble your axle just to service your birfields. 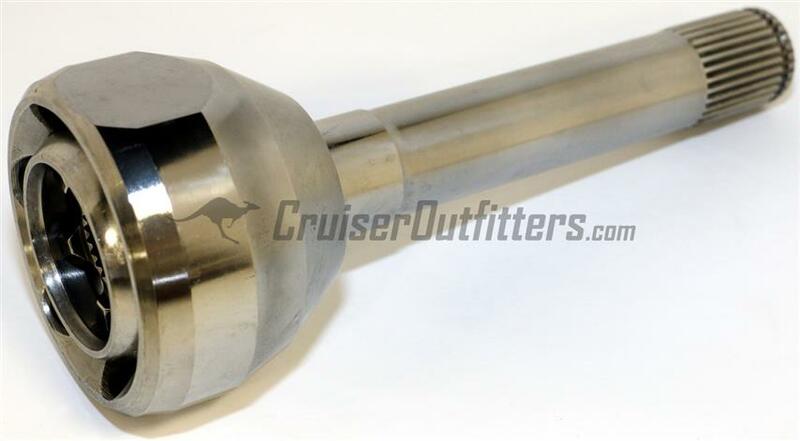 The 80 Series Gun Drilled 30-Spline Birfields also have a shallow relief near the splines on the stub shaft known as a Machined Spline Saver. The Machined Spline Saver eliminates stress concentrations caused by grooving from the tool that makes the splines on the stub shaft. The stress concentration from the spline groove is a common failure point on birfield stub shafts. The stub shaft of the Birfield has dual snap ring grooves to accommodate 80 Series with short and long drive flanges. The axle shafts are also made out of 4340 chromoly steel. 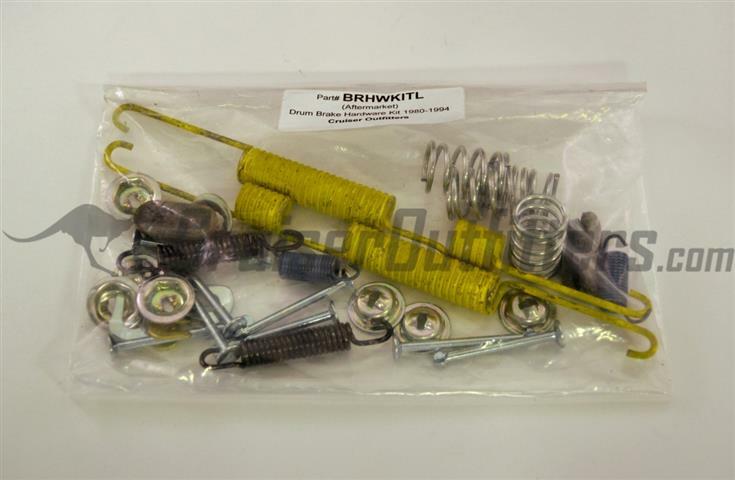 Included in this kit is a set of new 80 Series ABS Tone Rings. 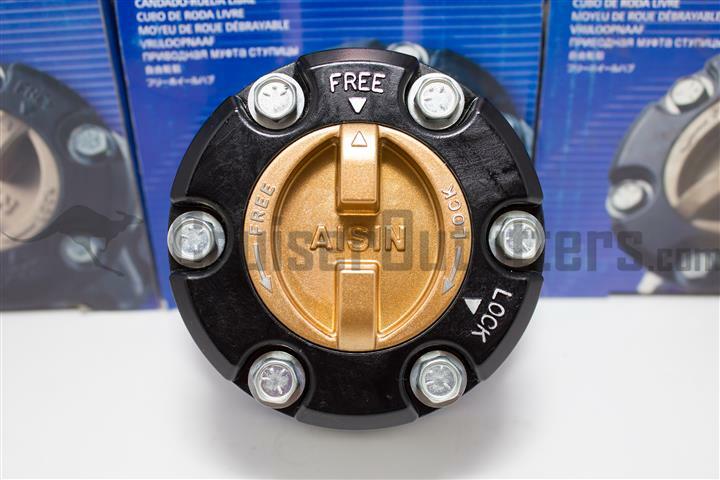 This will allow you to install the Longfield 80 Series Gun Drilled 30-Spline Super Set on both ABS and Non-ABS 80 Series applications. No other kit on the market can compare. 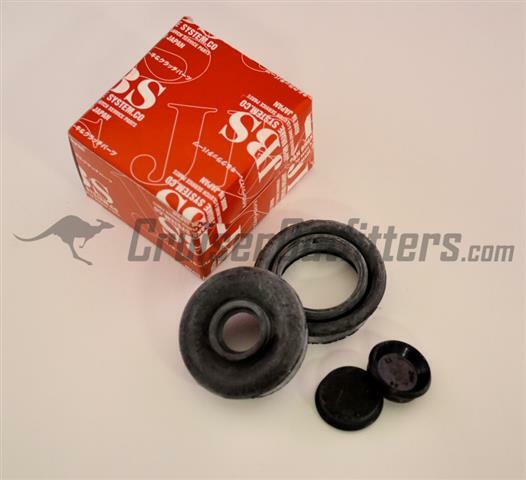 Note: Included is the 80 Series Extended Dust Caps for 1990-1994 models that use short drive flanges. 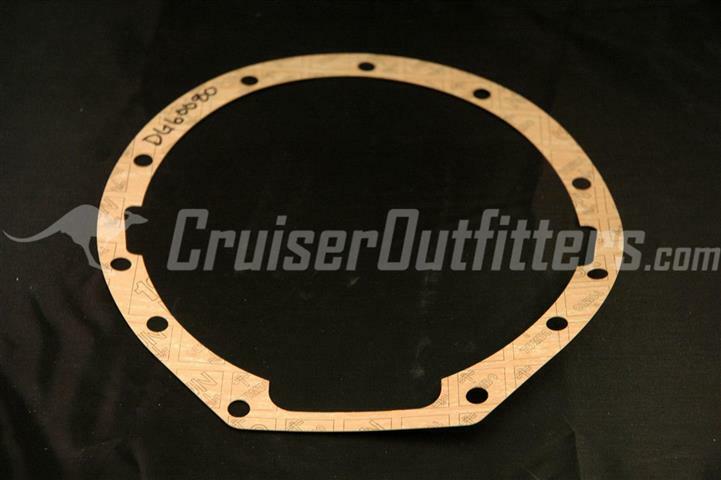 Front Axle Shim & Gasket Kit - $40.00 ea. 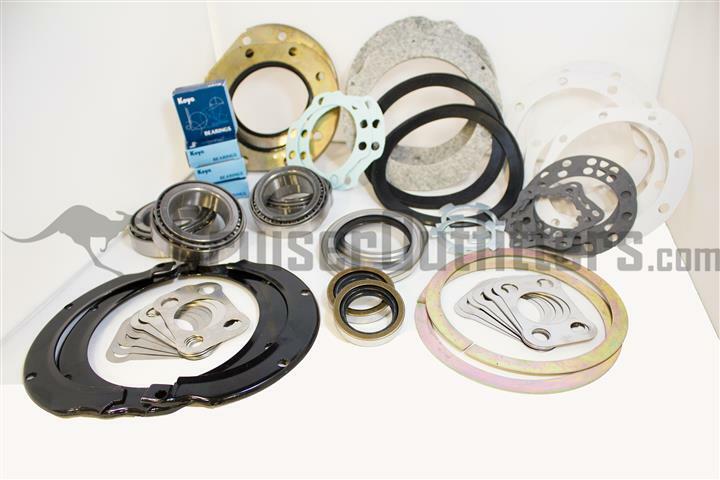 Includes felt & rubber wipers, steel wiper rings, spindle & backing plate gaskets, hub dust seals, hub gaskets and shims. One kit required per axle. 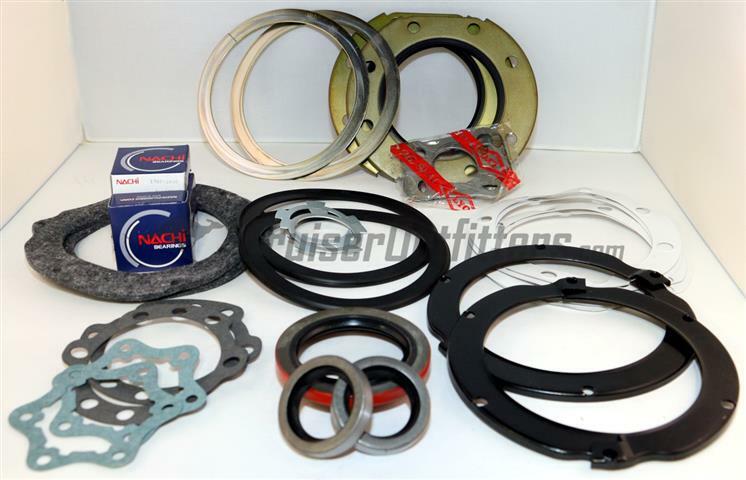 Includes felt & rubber wipers, steel wiper rings, spindle& backing plate gaskets, hub dust seals, hub gaskets and shims. One kit required per axle. 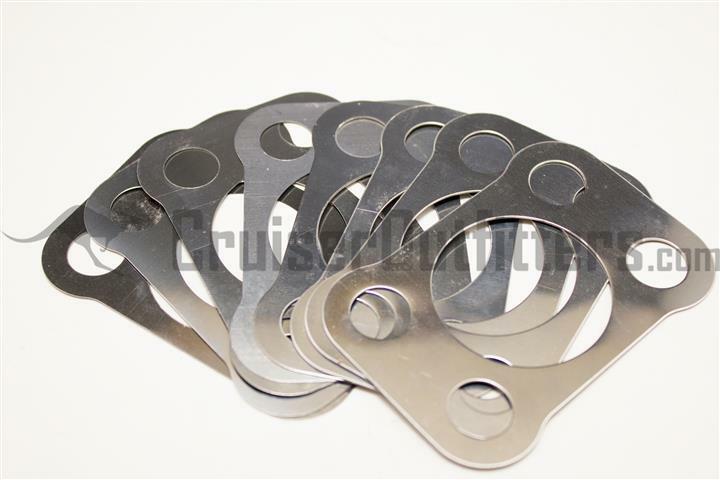 Front Axle Shim & Gasket Kit - $49.50 ea. 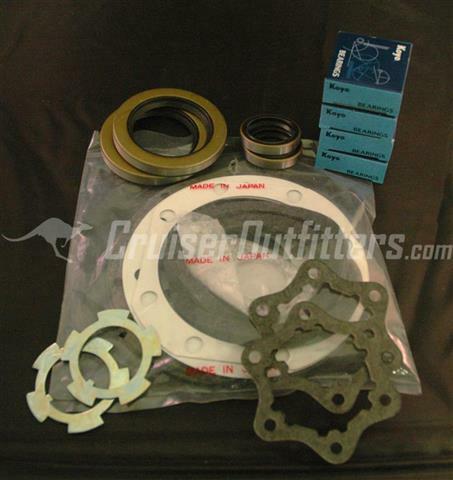 Note: Shim & Gasket Kits do not include wheel seals, inner axle seals or spindle lock washers. Please order those items individually as needed from selection below. 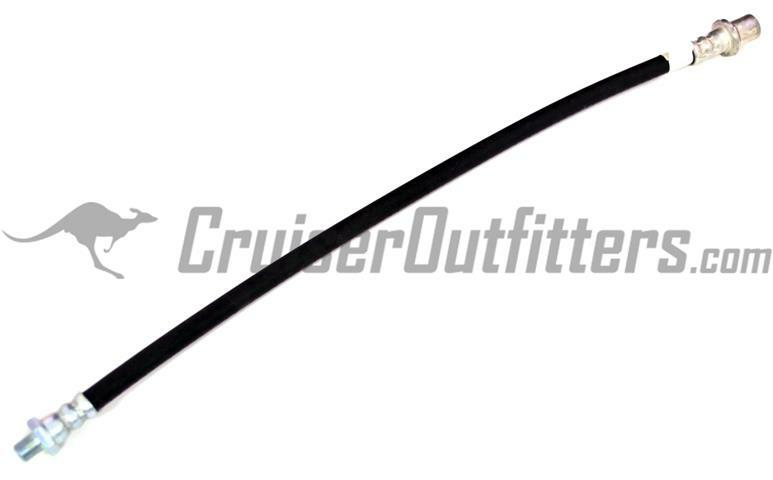 Knuckle Wiper Kit Early-90' - $15.50 ea. 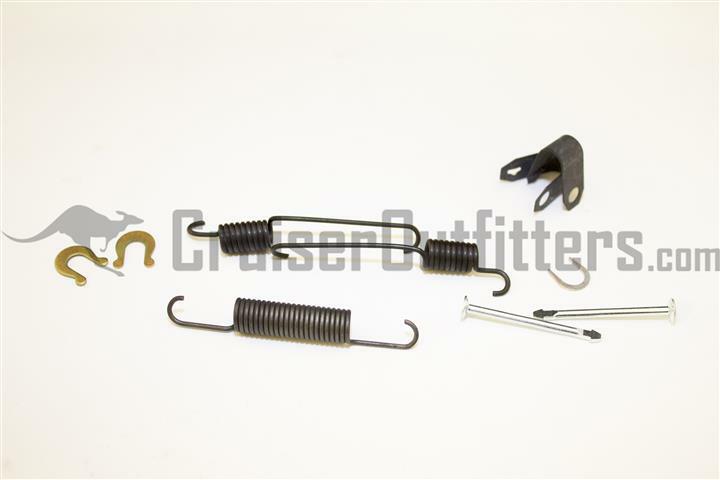 HD Knuckle Wiper Rock Ring Kit Early-90' - $33.50 ea. 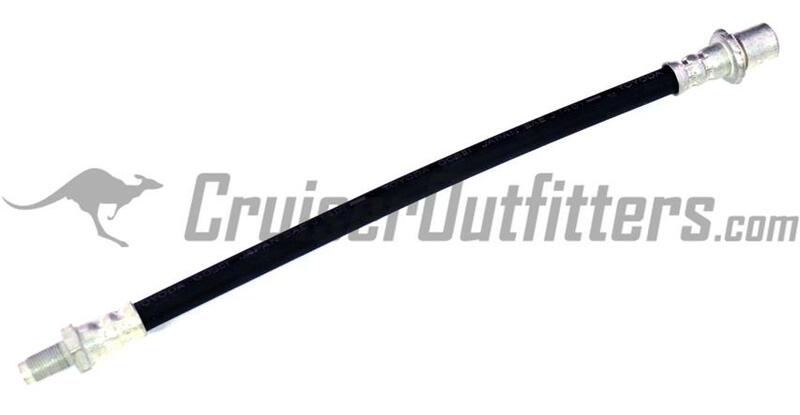 Knuckle Wiper Kit 90'-97' - $18.50 ea. 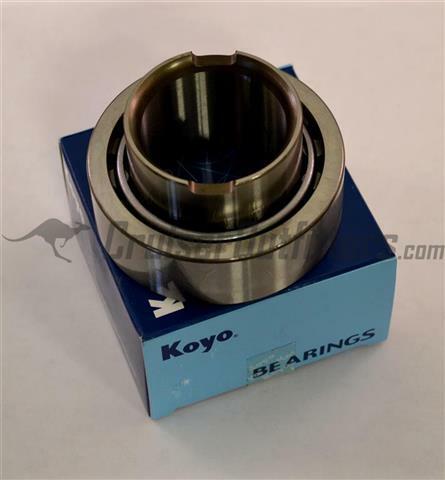 4 Required per axle, Japanese Koyo Bearings w/correct taper. 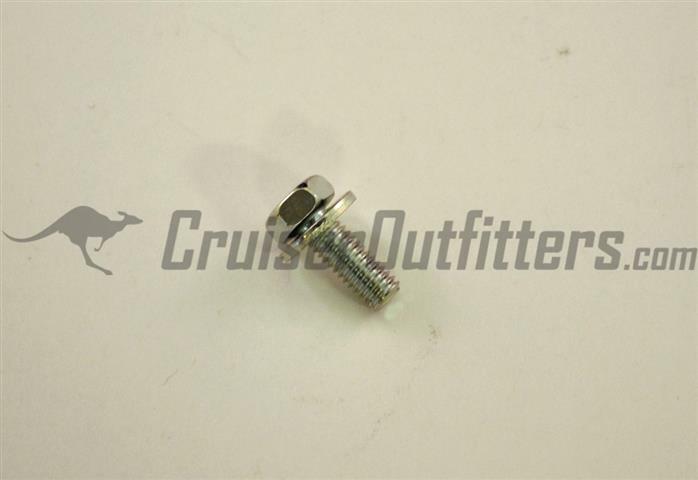 Part# FA17001 - $17.50 ea. 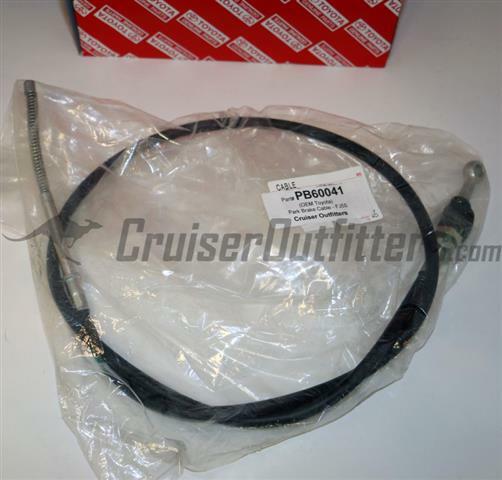 Part# FA17007 - $19.50 ea. 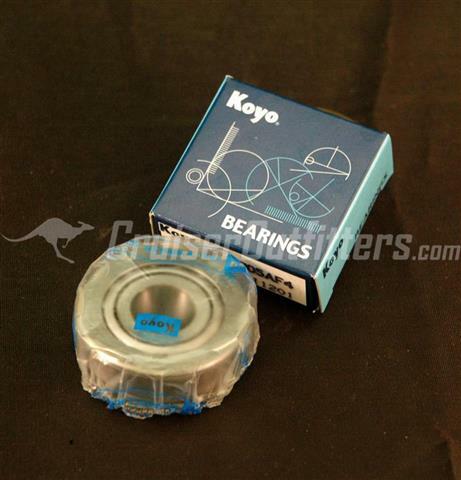 2 sets per axle, Koyo Bearings. 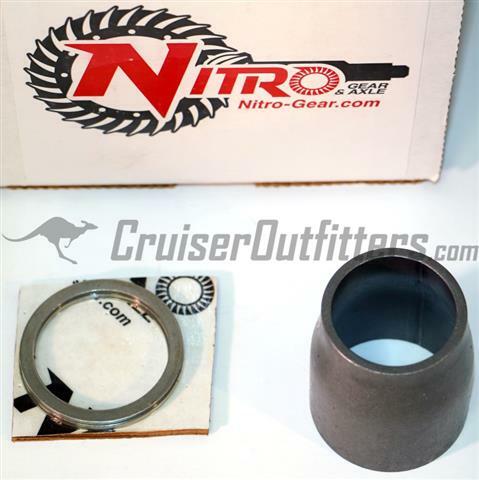 These unique bearing/race combos allow caster and camber adjustments without expensive axle modifications and repairs. Can be used to improve caster without decreasing pinion angle. 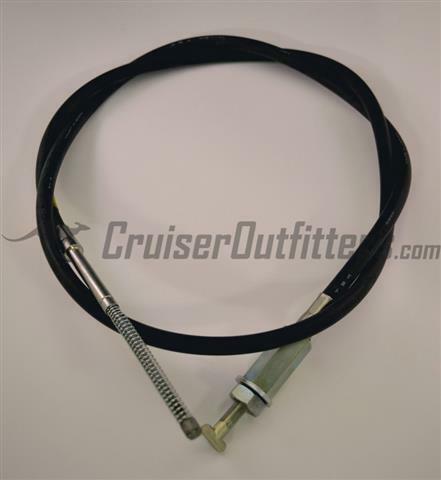 Can also be used to reduce interference issues with tie rod on the 80 Series while increasing caster following a suspension install. 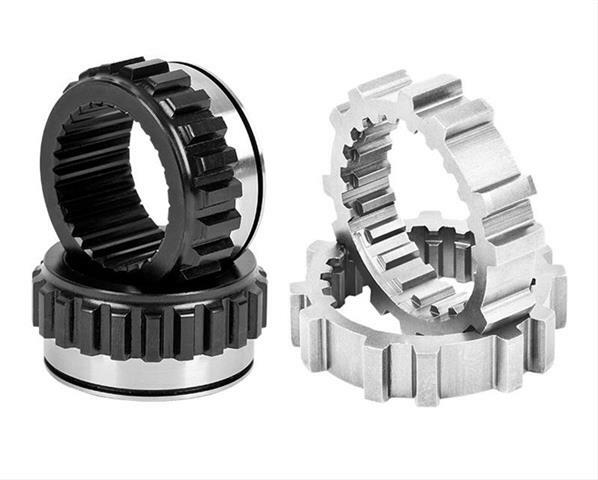 Note: Caster/Camber adjusting bearings are sold as a pair, including two bearings and two corresponding races. 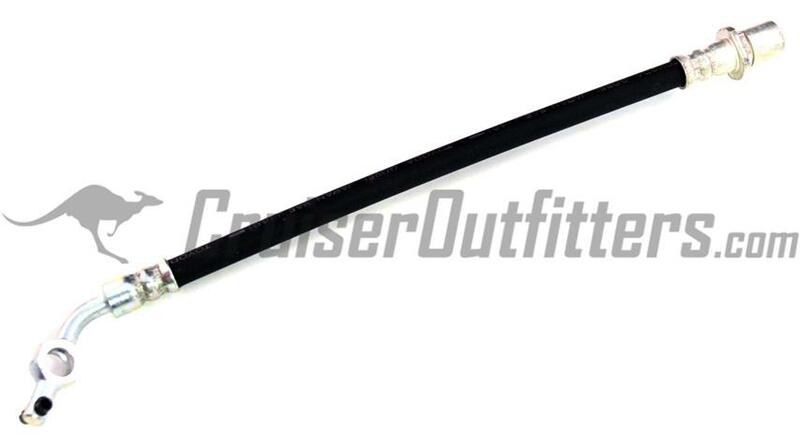 You must order two pairs for a complete axle retrofit. 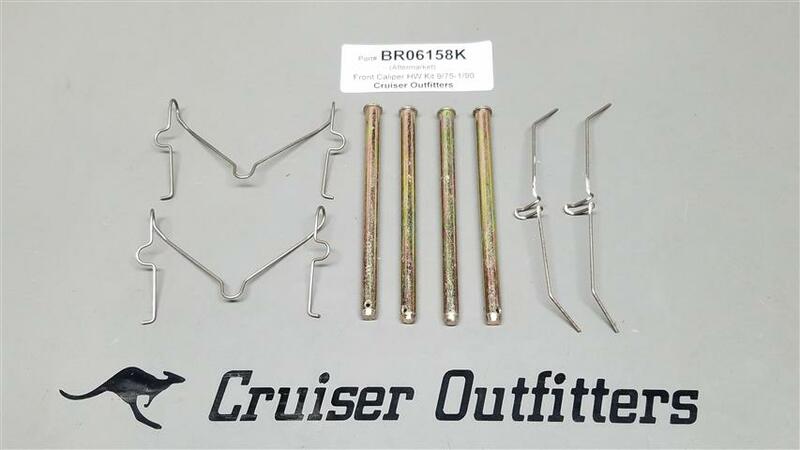 These shim packs allow for proper adjustment of the knuckle bearing preload on the Early - 1990 4x/5x/6x/7x & 79-85 PU/4Runner axles. Contains 8 shims of varied thickness. One per axle generally suffices if you have some originals to choose from. 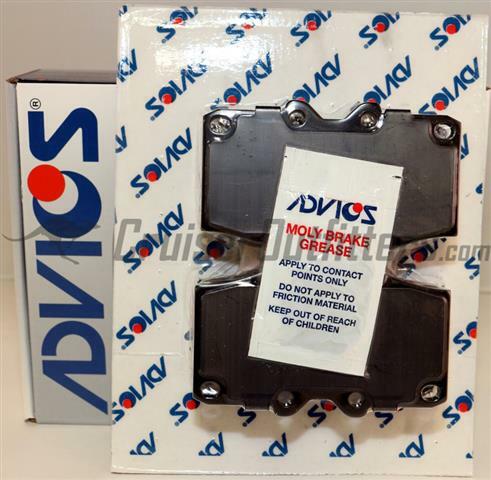 If you have no original shims, two packs may be ideal. OEM Toyota. 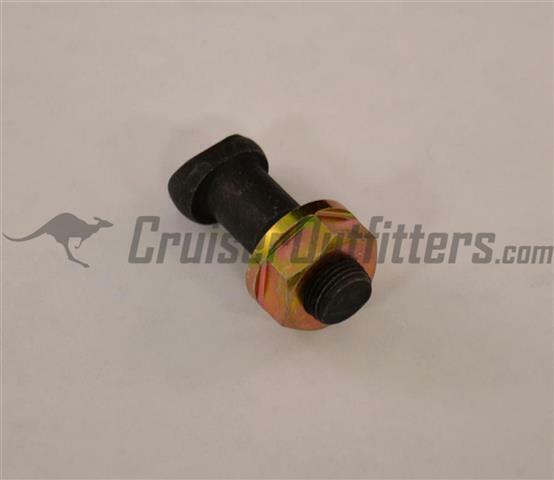 Fits 8x Series Land Cruisers. 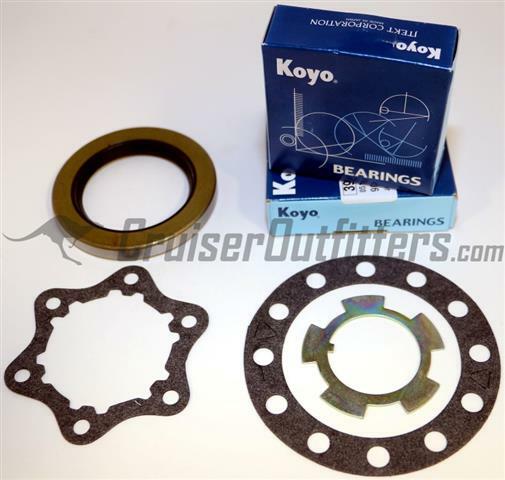 Includes inner and outer Koyo wheel bearings, races and wheel studs. 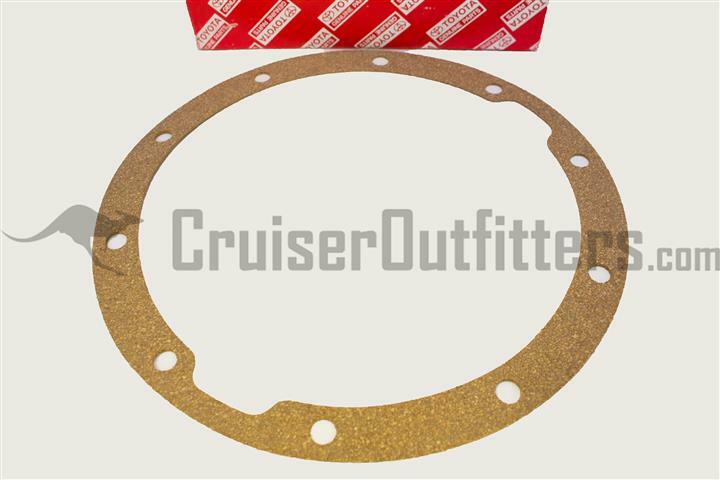 Does not include hub studs or hardware, seals or gaskets, order as needed. One required per side, two per axle. Trail Gear Chromoly Replacement/Upgrade. 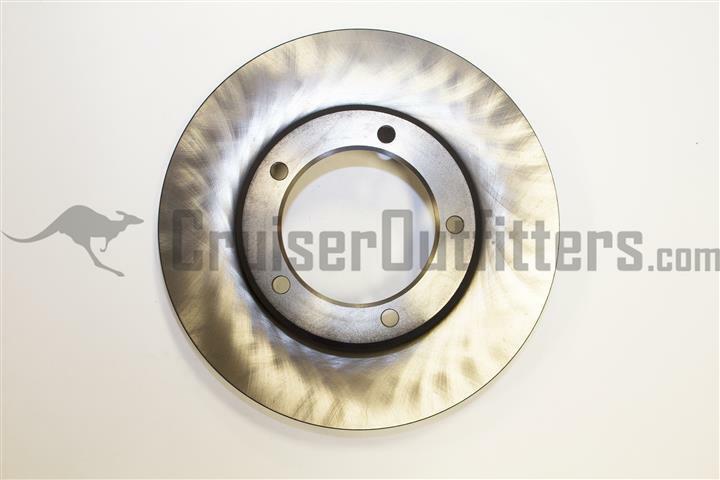 Fits 9/1975-1990 4x/5x/6x/7x & 79-85 PU/4Runner or earlier model Land Cruisers with factory Toyota disc brake conversions. Spindle bushing not included, order part# HUB70067/HUB70067OEM or re-use original spindle bushing. One required per side, two per axle. 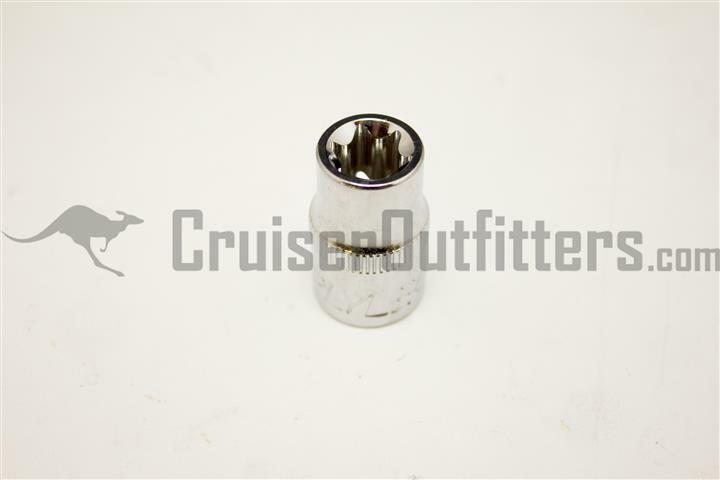 Joint Fuji Japanese Replacement w/Spindle Bushing. 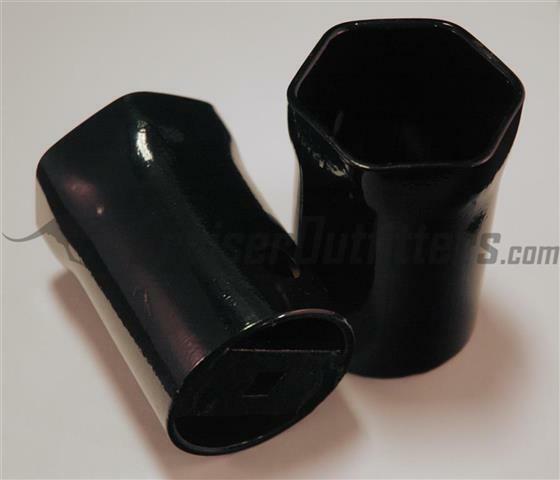 Fits 9/1975-1/1990 4x/5x/6x/7x Series. 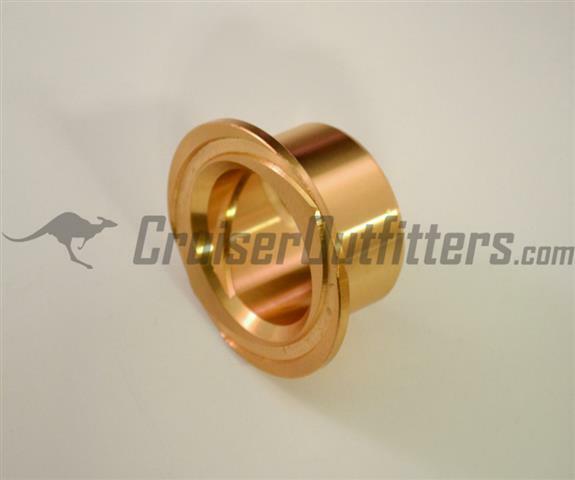 Spindle bushing is pre-installed so no additional parts are needed. One required per side, two per axle. 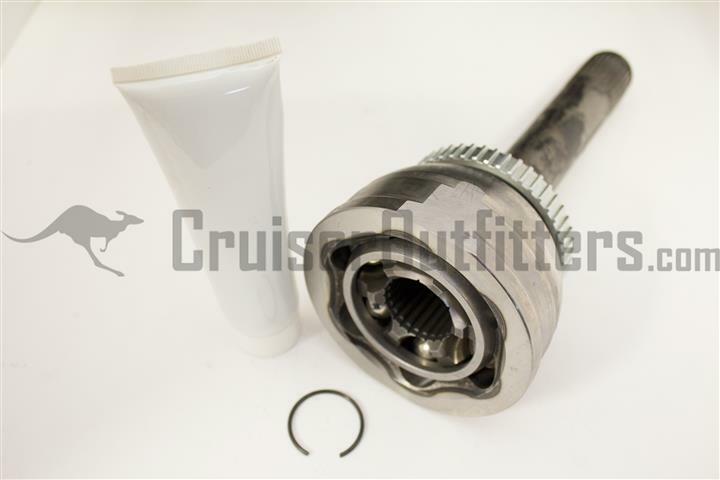 Joint Fuji Japanese Replacement w/Upgraded Spindle Bushing/Bearing. 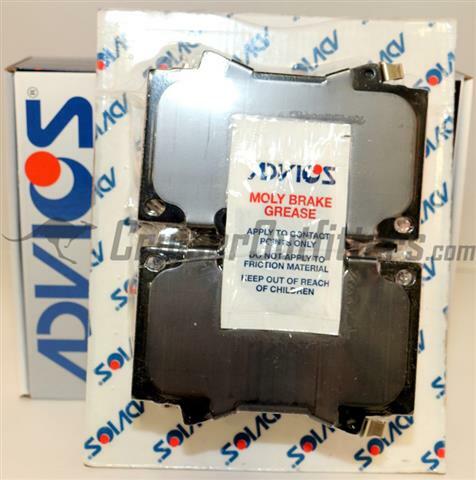 Fits 1/1990-12/1997 8x Series/LX450. 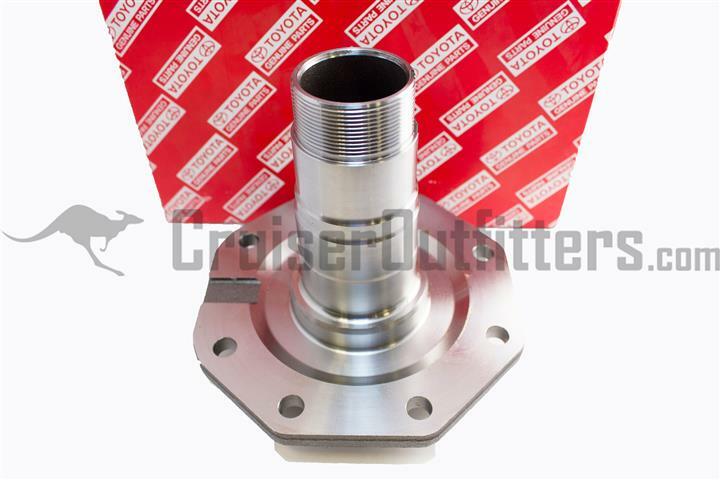 Spindle bushing/bearing combo is pre-installed so no additional parts are needed. One required per side, two per axle. 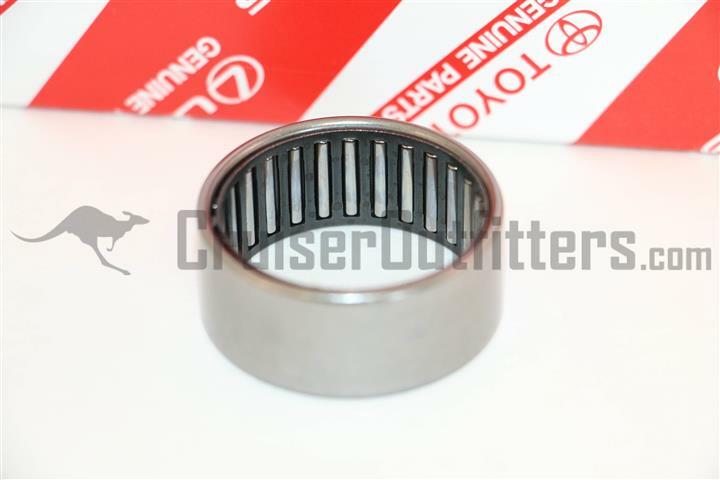 OEM Toyota Replacement w/Upgraded Spindle Bushing/Bearing. 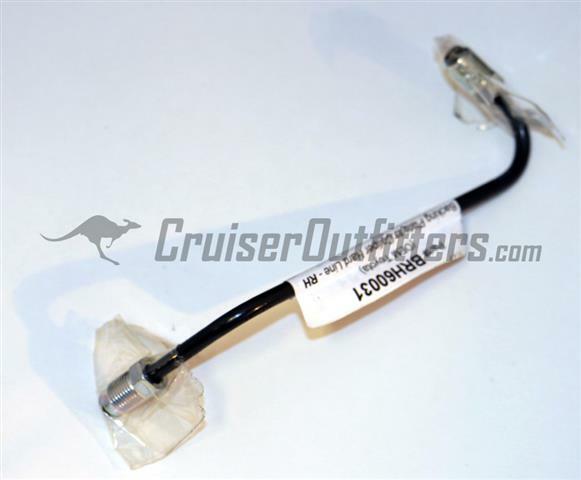 Fits 1/1990-12/1997 8x Series/LX450. 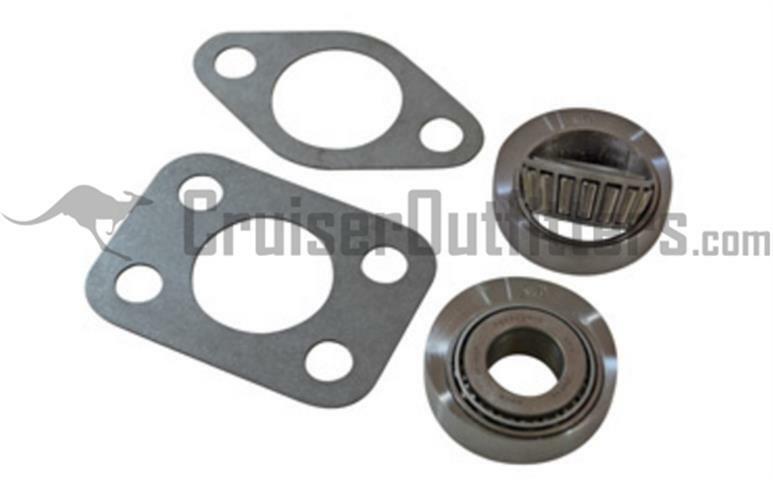 Spindle bushing/bearing combo is pre-installed so no additional parts are needed. One required per side, two per axle. 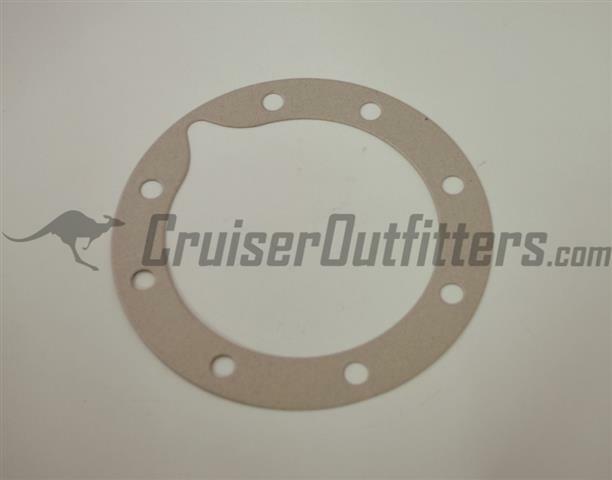 Spindle Gasket - $5.50 ea. 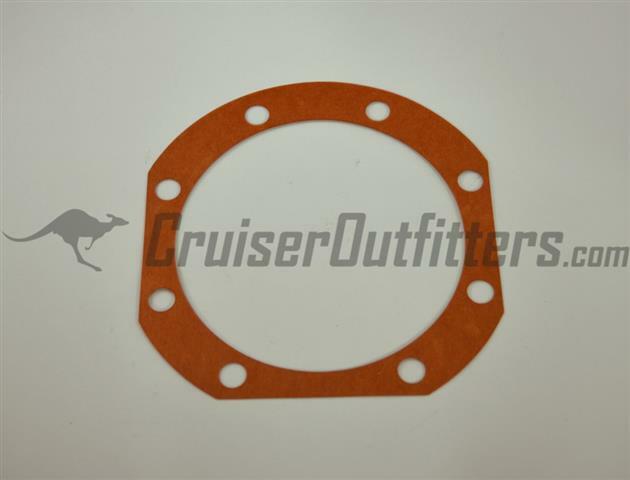 Hub Dust Seal- $10.50 ea. 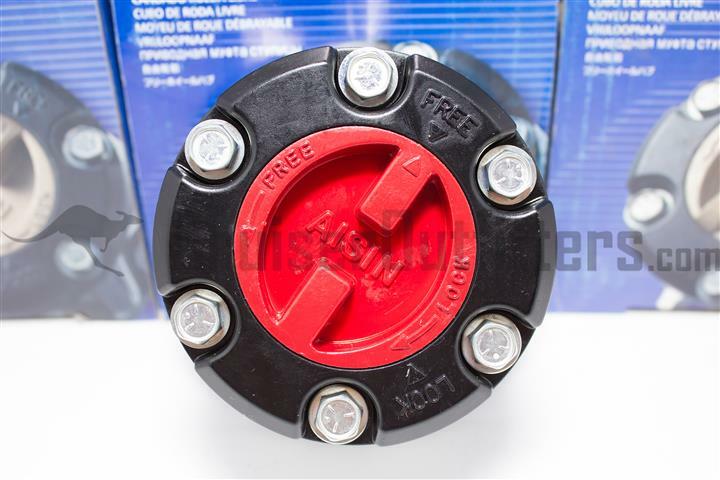 Hub Dust Seal- $17.50 ea. 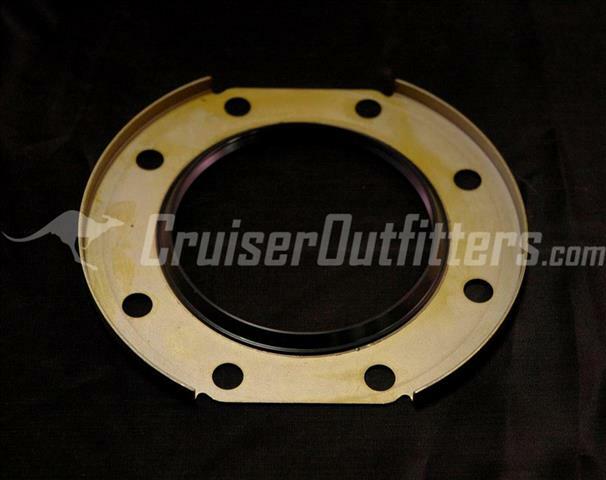 Hub Dust Seal- $65.50 ea. 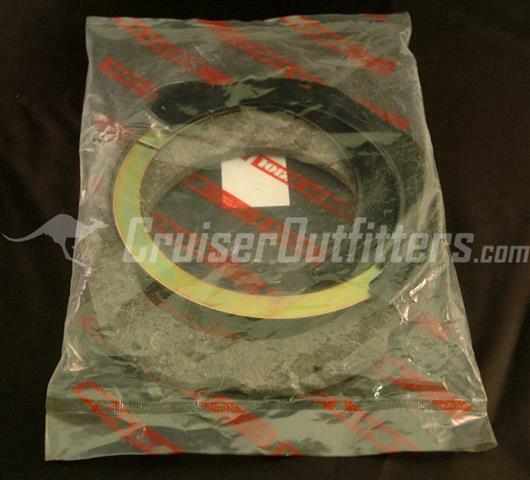 Front Hub/Wheel Seal E-9/1975- $6.00 ea. 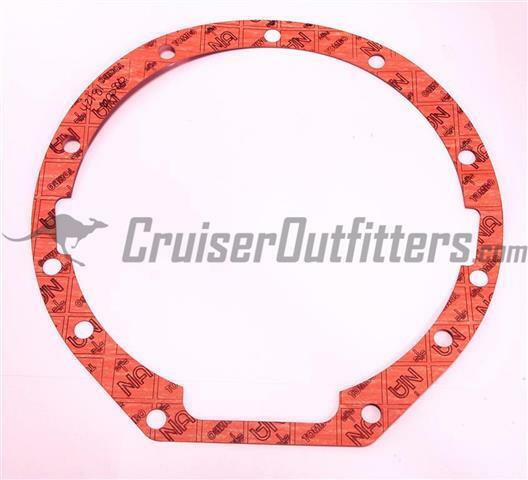 Front Hub/Wheel Seal 75-97- $5.25 ea. 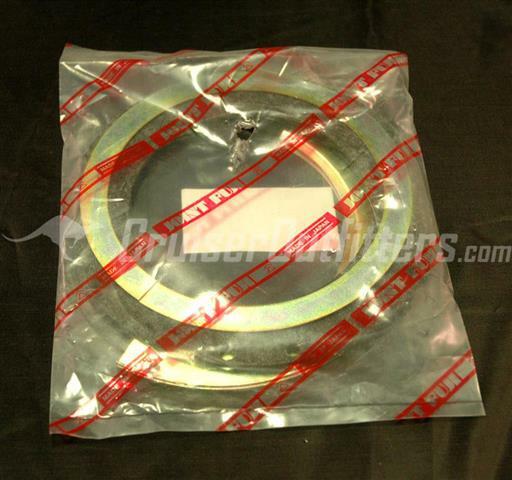 Front Hub/Wheel Seal 100 Series - $26.50 ea. 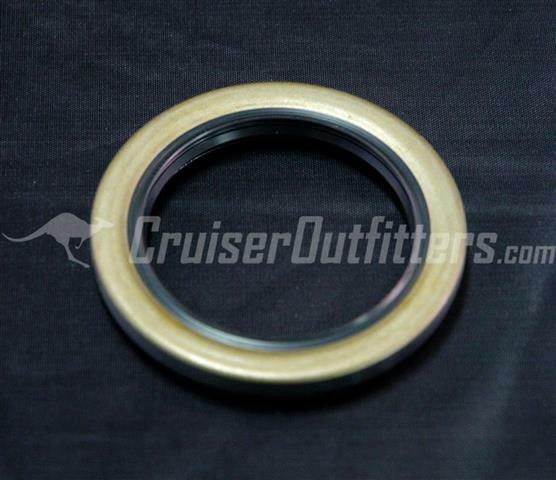 Japanese Inner Axle Seal - $2.50 ea. 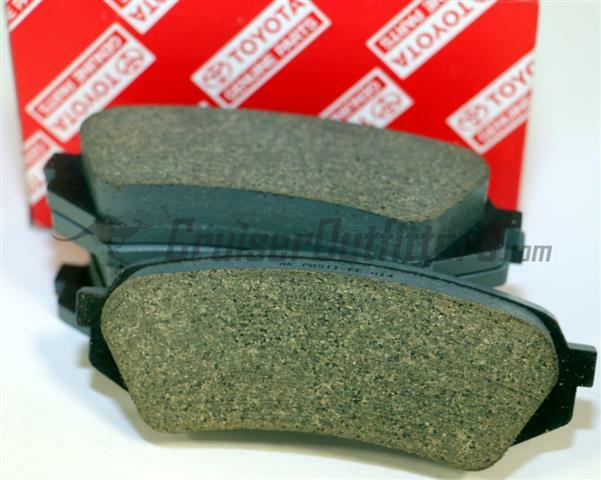 A must have for knuckle repairs or birf swaps. 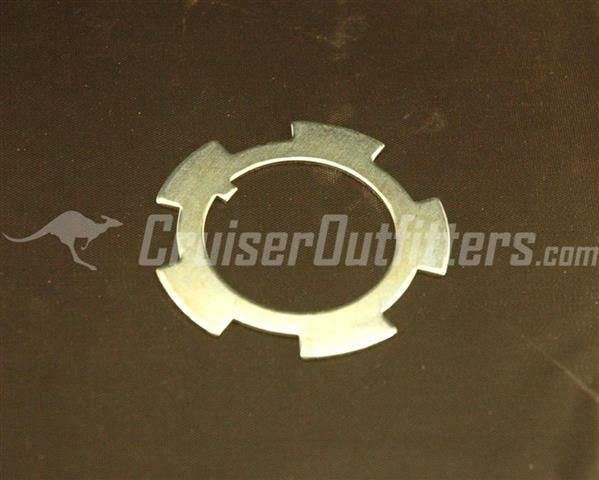 Marlin Crawler Inner Axle Seal - $8.50 ea. 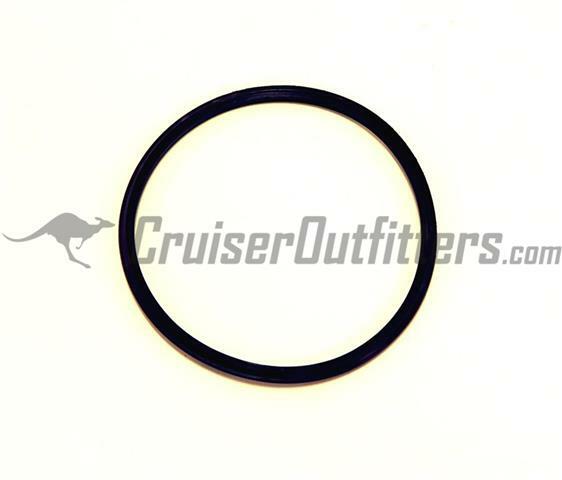 Japanese Inner Axle Seal - $4.75 ea. 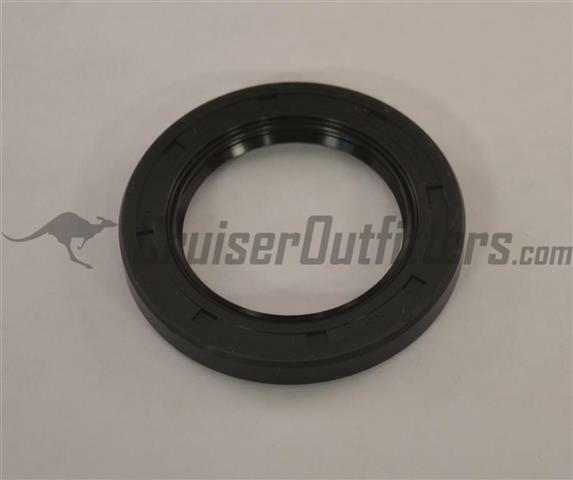 OEM Toyota Inner Axle Seal - $11.50 ea. 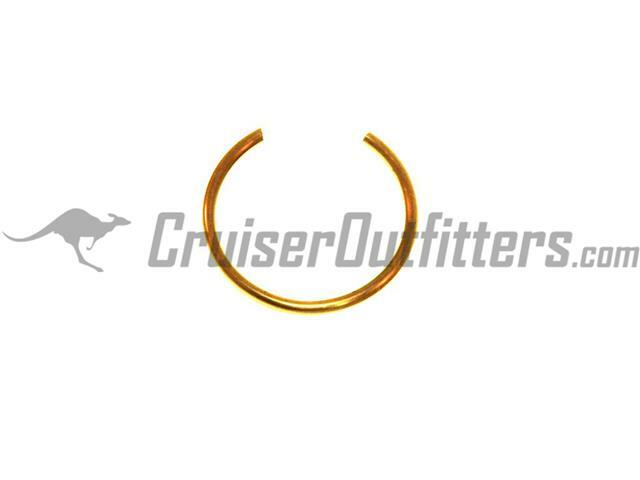 Marlin Crawler Inner Axle Seal - $12.00 ea. 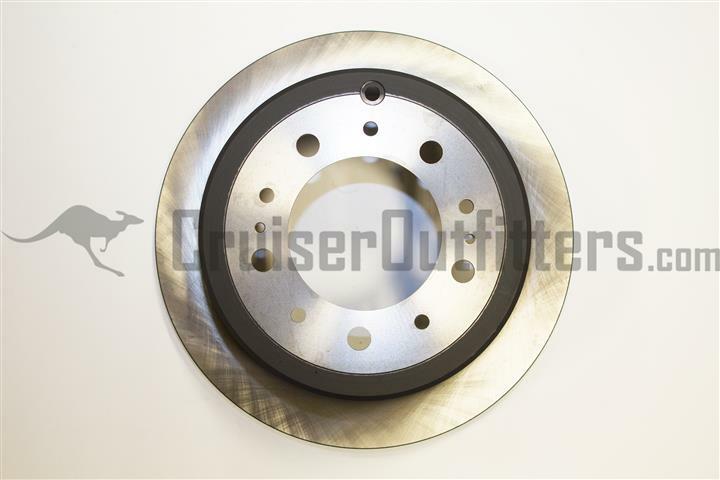 Spacer allows you to delete your bent or damage disc brake backing plates for a clean look. 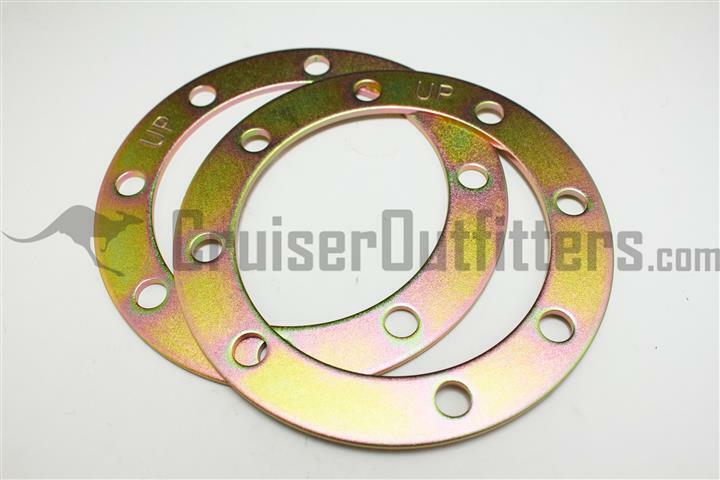 Sold per pair, one pair required per front axle. 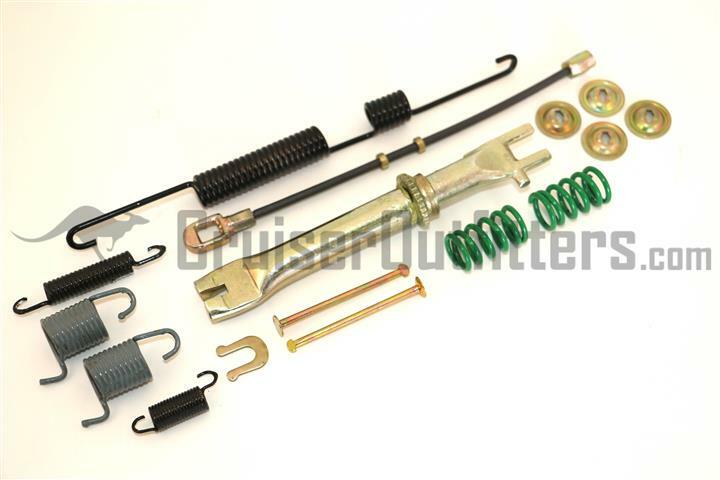 Kit comes complete with boots, clamps, clips and grease for ONE (1) CV Axle. Two kits required per vehicle. A must have in the garage or on the trail. 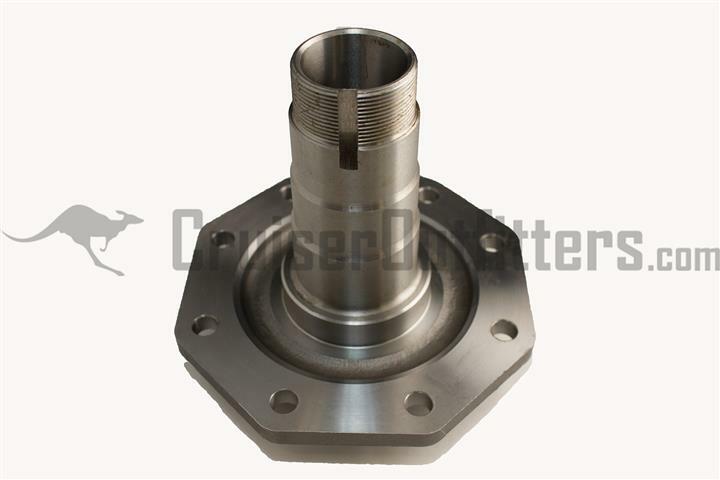 54mm drive hub socket is a mandatory tool while performing any work on the FRONT axle. 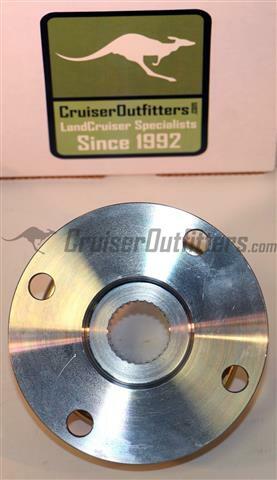 Available in 3/8" drive. A must have in the garage or on the trail. 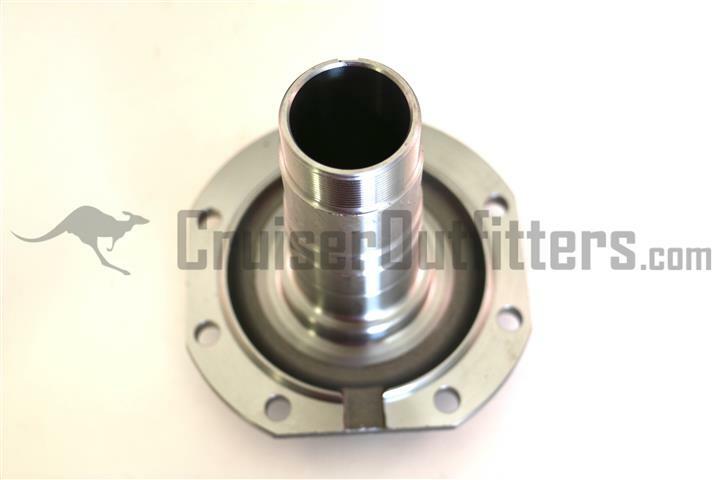 39mm drive hub socket is a mandatory tool while performing any work on the FRONT IFS suspension/axle. 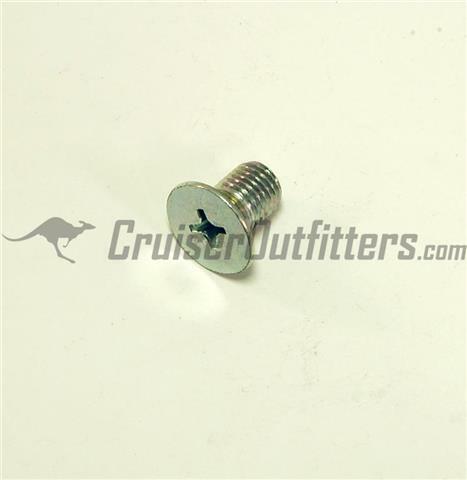 Available in 1/2" drive. 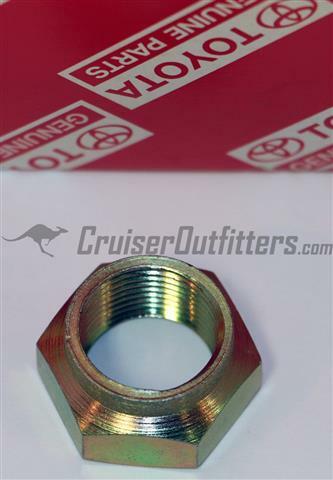 A must have in the shop when rebuilding a front (or full-float rear) axle, repacking wheel bearings or setting up knuckle bearing preload. 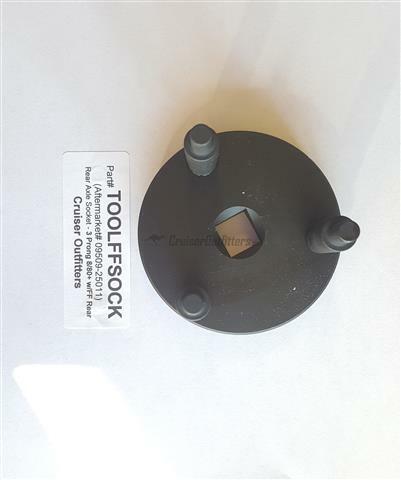 Use of tool is covered by instruction manuals included with our knuckle rebuild and wheel bearings kits. 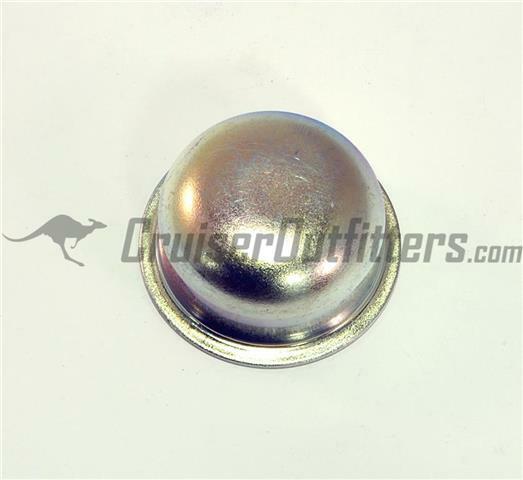 Use our Knuckle Stud Socket to install the 1979-97 knuckle studs with proper torque. Works with KS12005 studs only. 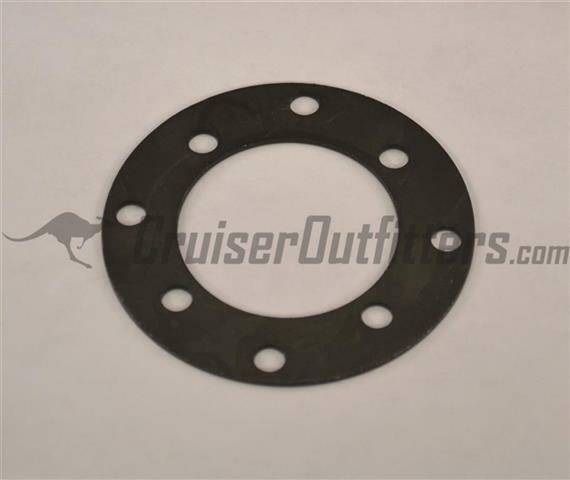 For use on the free-hub/drive flange snap ring found on Early - 2007 Land Cruisers including the 2x/4x/5x/6x/7x/8x/10x models. 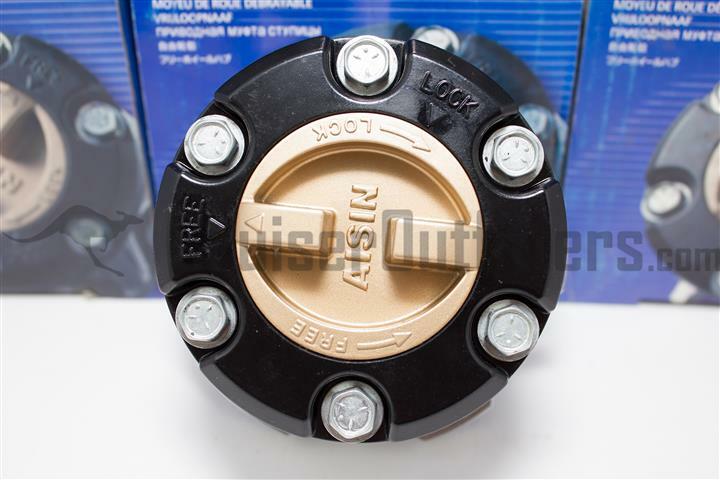 Allows easy removal and installation of the snap ring without damage. A must have in the garage or on the trail. 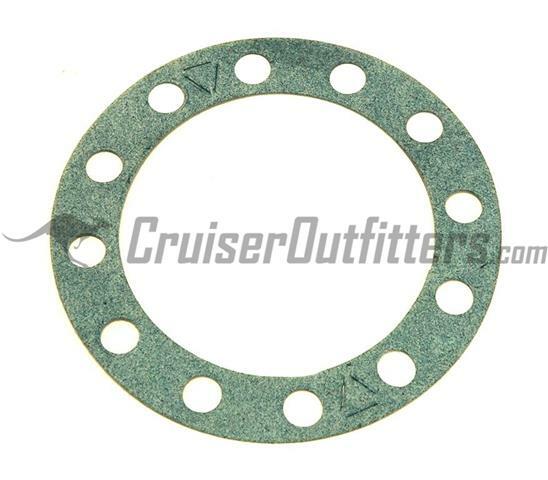 OEM Replacement Axle/Birf Snap Rings. 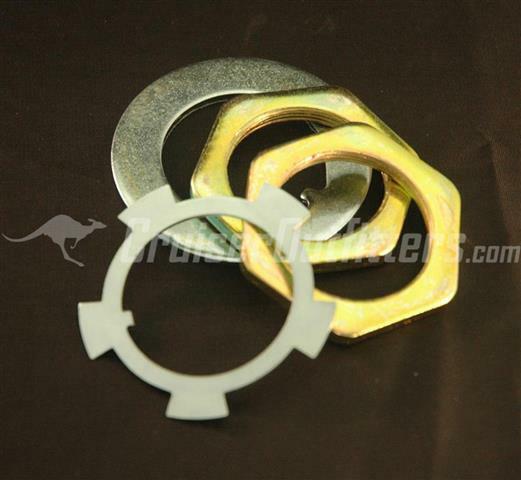 Two of each part number required for full replacement of rings. 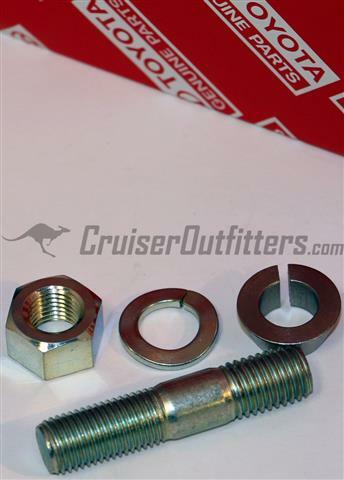 Spindle Nut Kit - $11.00 ea. Includes spindle two nuts, lock washer and tab washer. 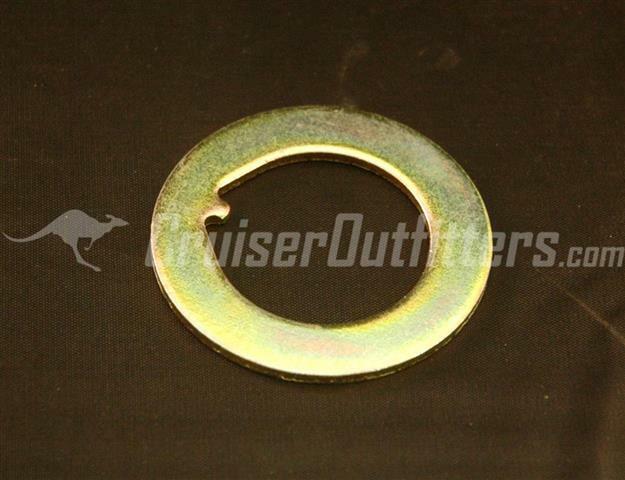 Spindle Tab/Thrust Washer - $3.00 ea. 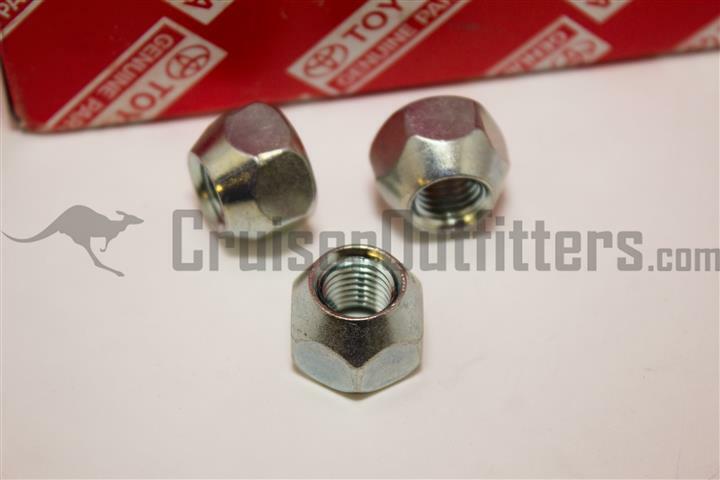 Replace damaged & worn nuts. 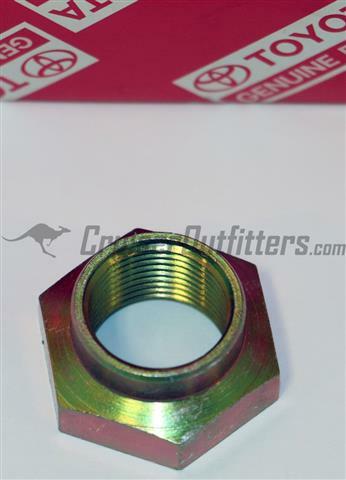 Disc Spindle Nut - $5.00 ea. Four required per axle, 2 per side. 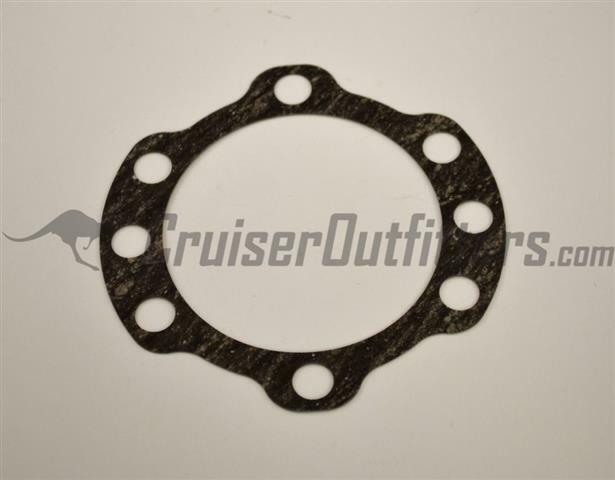 Each set comes complete with two wheel bearings, wheel seal, locker washer and hub gasket. One required per side, two per vehicle. 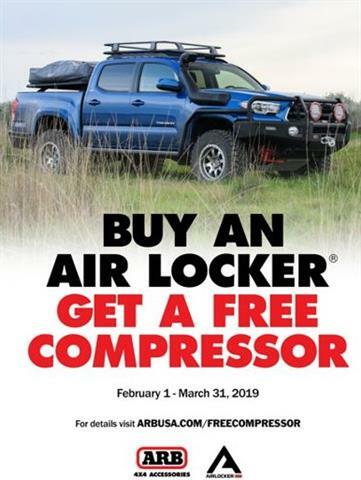 (Fits 98'-07' UZJ100 & LX470) - 1 Req'd per vehicle. 1958-1/1979 4x/5x - Part# KS11033 - $3.75 ea. 1/1979-1/98 4x/5x/6x/7x/8x - Part# KS12005 - $2.50 ea. 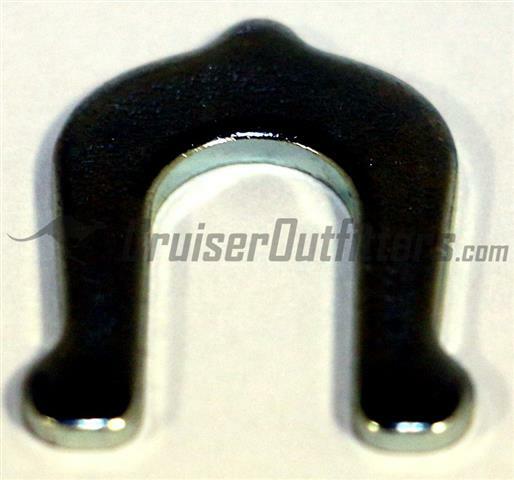 Use our Knuckle Stud Socket to install the 1979-97 knuckle studs with proper torque. 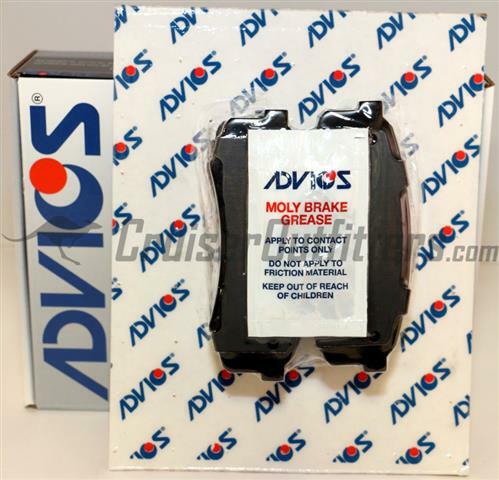 Works with KS12005 only. 1958-1/1979 4x/5x - Part# KS55010 - $4.00 ea. 1/1979-1/98 4x/5x/6x/7x/8x - Part# KS60020 - $3.50 ea. 1958-1/1979 4x/5x - Part# KS01100 - $1.25 ea. 1/1979-1/98 4x/5x/6x/7x/8x - Part# KS01200 - $1.00 ea. 1958-1/1979 4x/5x - Part# KS11059 - $2.00 ea. 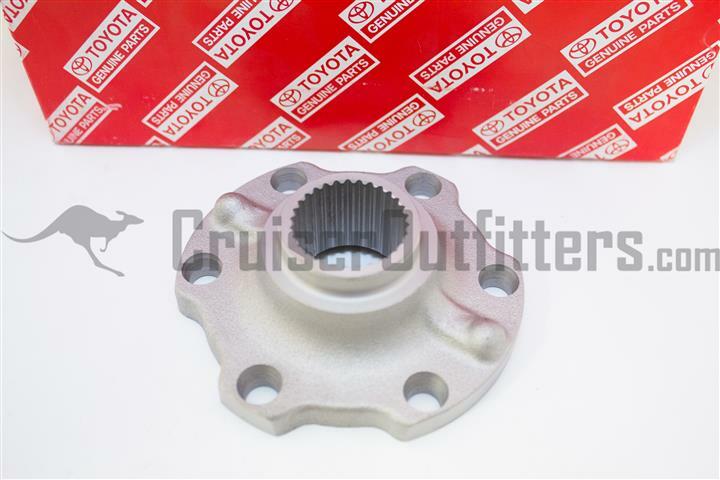 We have 100's of AISIN hubs in stock for nearly every Toyota application. Please call if you don't see the hub you are after. 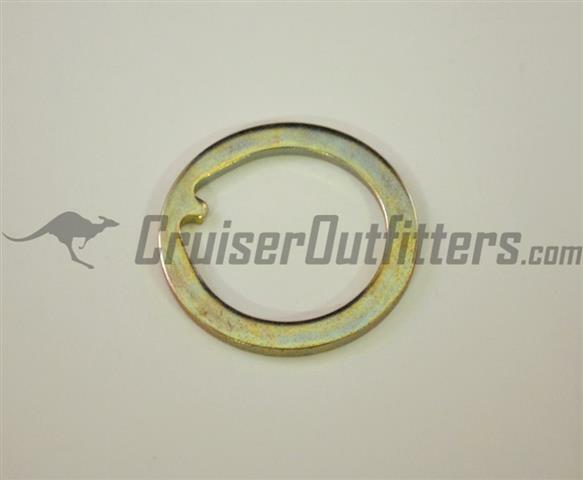 NOTE: 4/1994 - 1/1998 80 Series vehicles will require replacement birfields featuring a double groove for the snap ring OR machining a second groove in the stock birfield for a lower snap ring. We have birfs in stock to accommodate this. Please call for specifics. 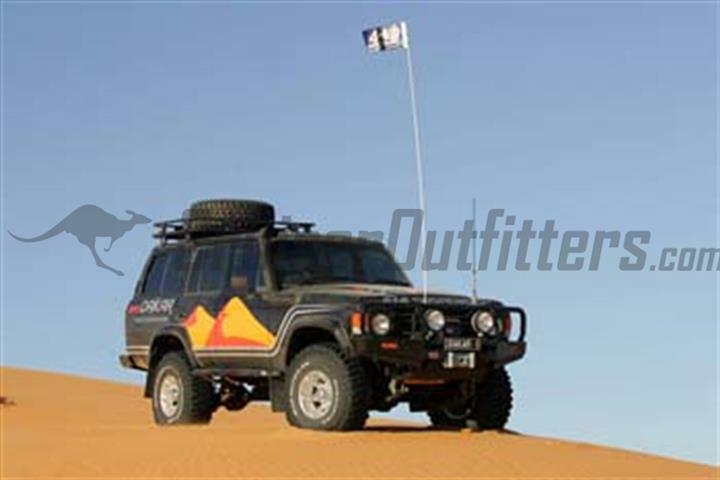 FAQ: What color was factory on my Land Cruiser? Great question, we are working on comprehensive guide, in the meantime please call. 9/75-1/79 4x/5x would have come equipped with either solid drive flanges or ASCO hubs (ASCO later became AISIN). 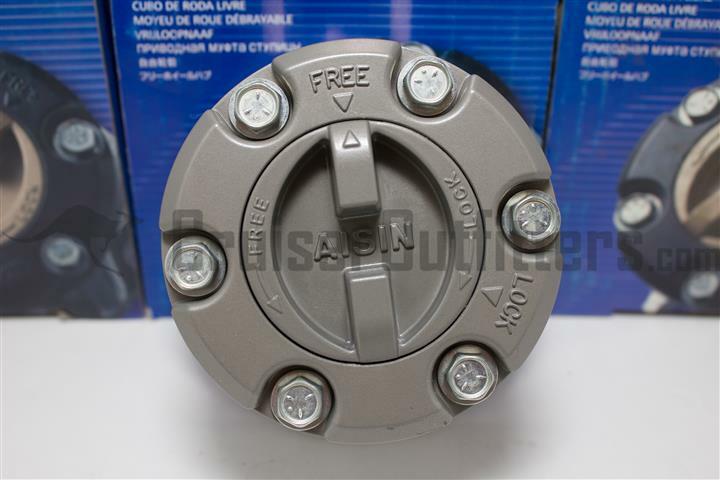 Many with solid drive flanges were replaced with WARN hubs at the dealer level before being sold. From 1/79-80 the 4x received a grey AISIN hub, after 1980 the 4x/6/ & 7x received a gold colored hub. 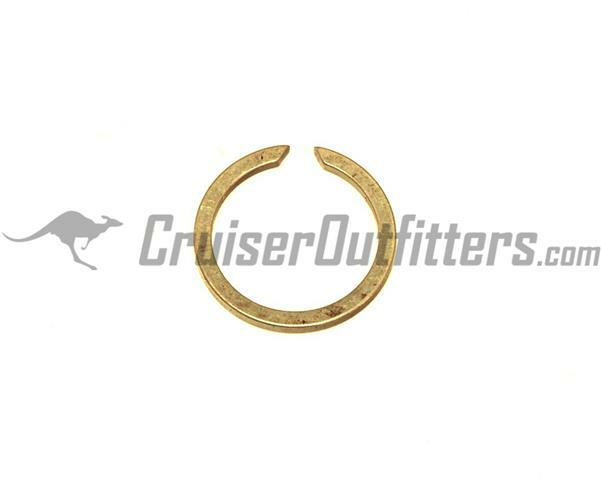 All non-US 8x/10x Land Cruisers received gold hubs. 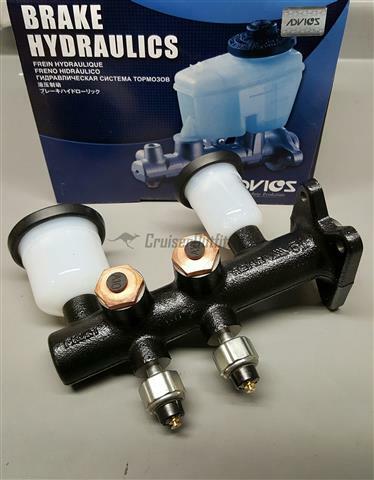 These can be retrofitted to US models with some modifications. 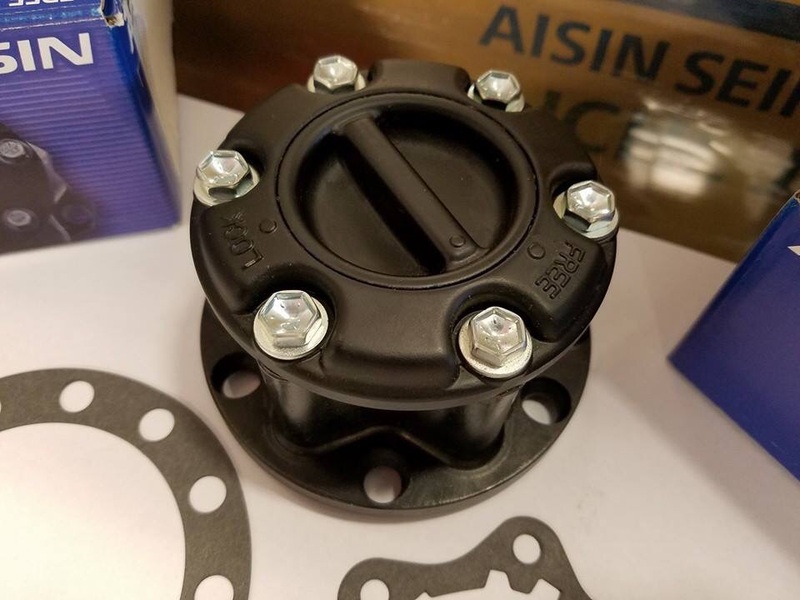 Heavy Duty AISIN black body hubs featuring Longfield chromoly inner hub gears and an O-Ring sealed body. 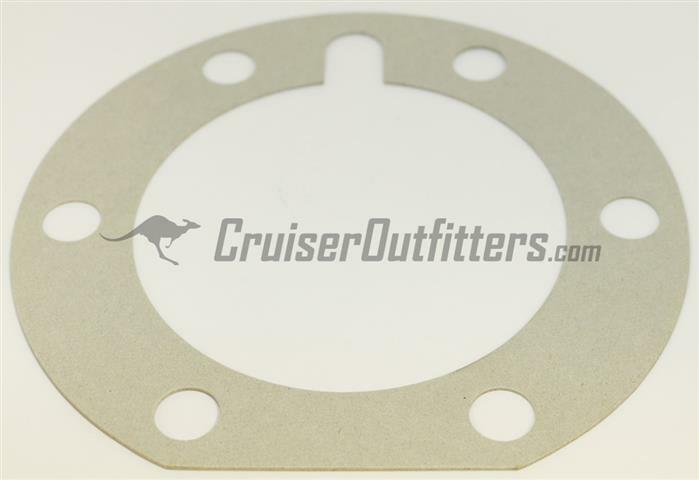 A direct fit for your 79-95 Land Cruisers (short birf 80's) and 79-85 pickups and 4Runners. 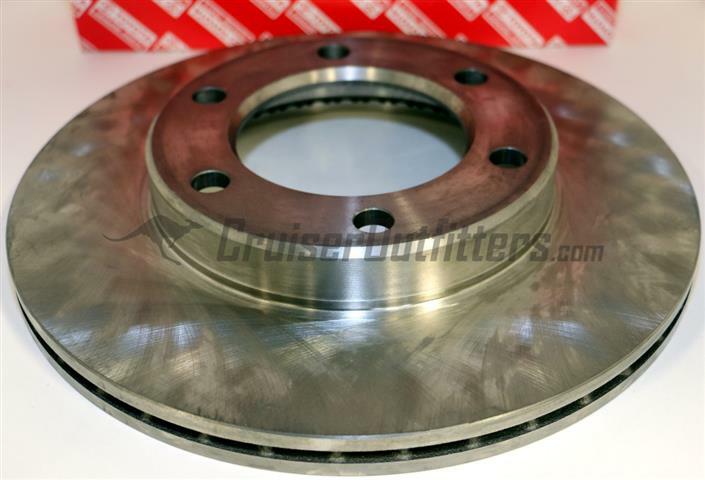 Can also be fitted to disc brake swapped earlier Cruisers, 9/75-79 with upgraded birfs & later 80's with aftermarket shafts or machining to the stock birf. 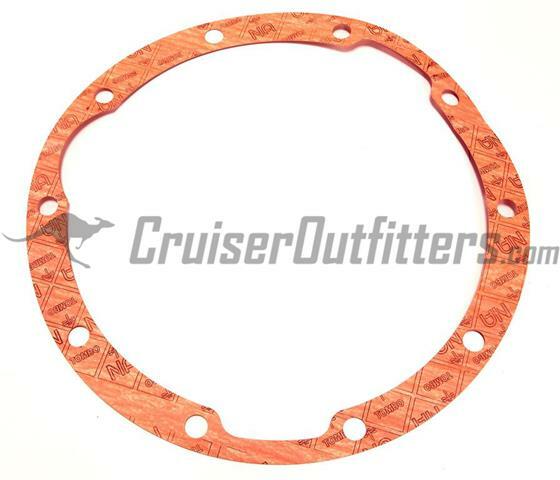 Click here to see our updated Land Cruiser transfer-case output flange page, including pattern and spline specifications. 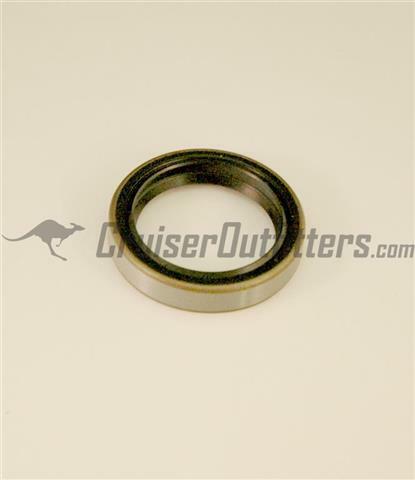 Pinion Seal - $6.00 ea. 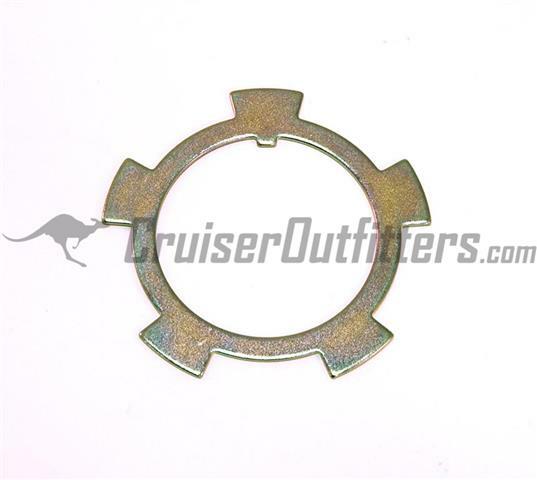 Marlin Crawler Heavy Duty Pinion Seal - $16.00 ea. 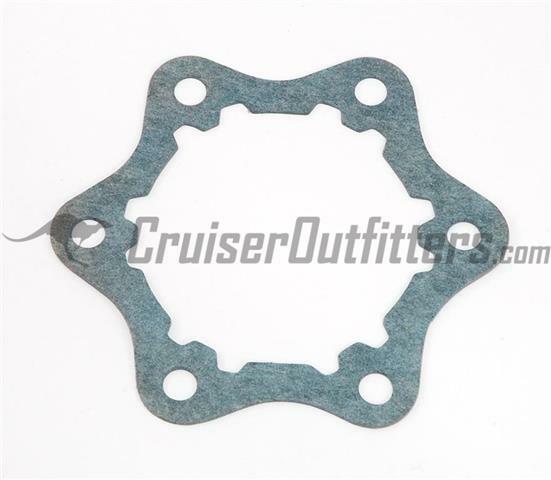 100 Series Front Pinion Seal - $12.50 ea. 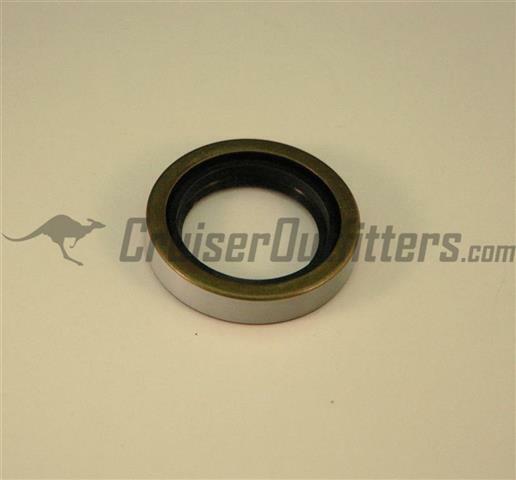 29 Spline Pinion Seal - $17.50 ea. 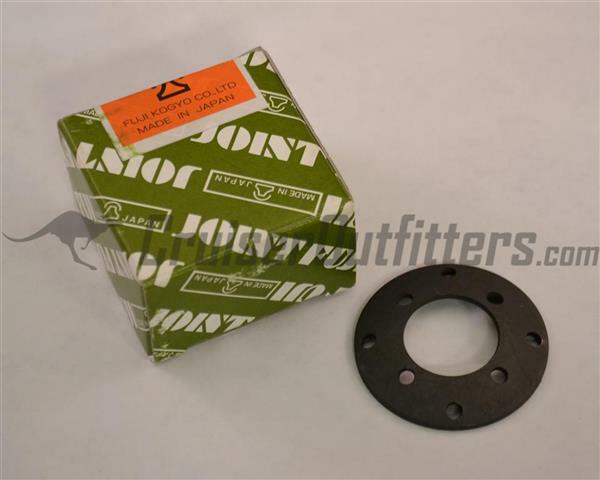 Heavy Duty 29 Spline Pinion Seal - $13.75 ea. 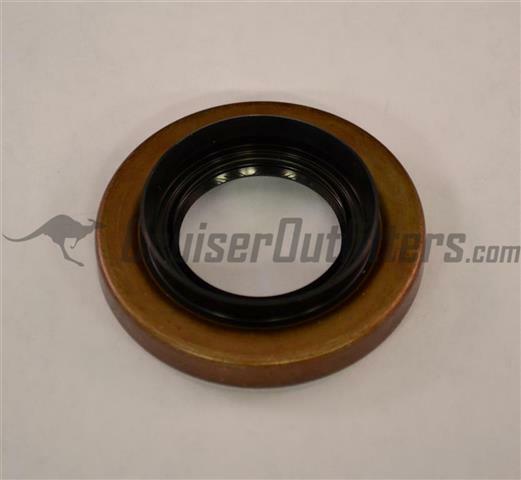 200 Series Front Pinion Seal - $36.50 ea. 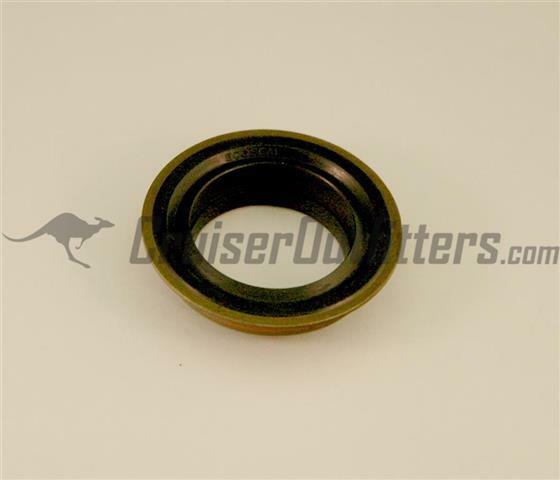 200 Series Rear Pinion Seal - $19.50 ea. 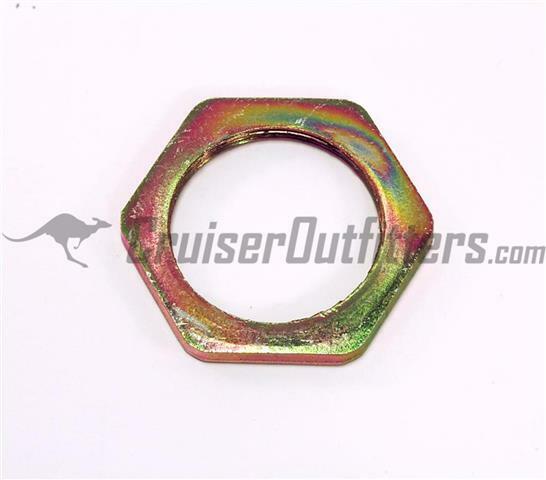 Pinion Nut - $4.50 ea. 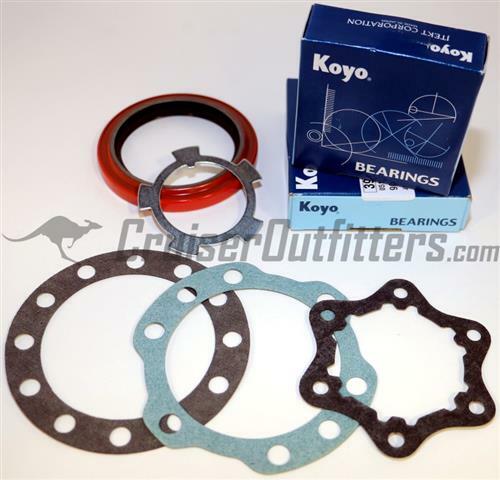 One required per axle, 2 Koyo Bearings, 2 Wheel Seals, and 2 differential gaskets. 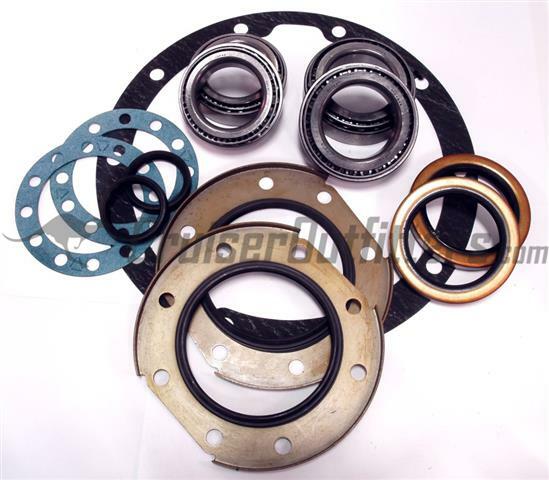 One required per axle, 4 wheel bearings, 2 inner axle seals, 2 axle flange gaskets, 2 wheel seals, 2 dust seals, 1 differential gasket. FAQ: Do I have a Semi-Float or a Full-Float axle? Great question. A semi-float axle means the rear axle shafts not only support the rotational load but also the load of the vehicles weight, so the wheel bolts directly to the axle shaft. 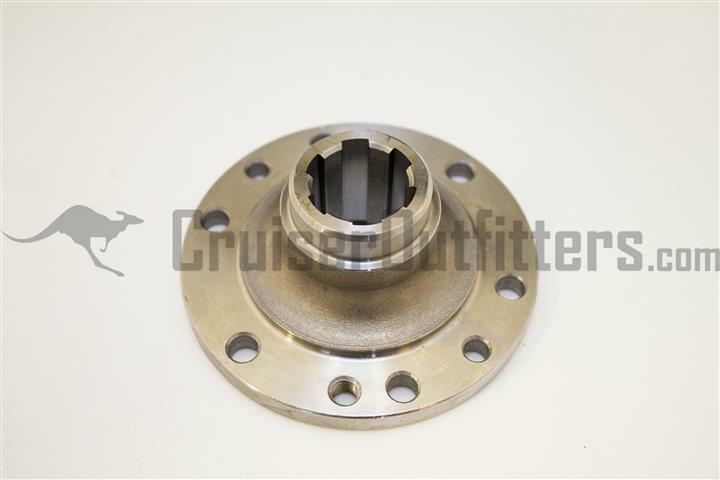 A full-float axle has an axle shaft that can be removed while the tire is still bolted to the hub assembly which actually supports the weight of the vehicle. Any US spec FJ40/55/60 and 62 is going to have a semi-float rear axle (all front axles are full-float for what it is worth). 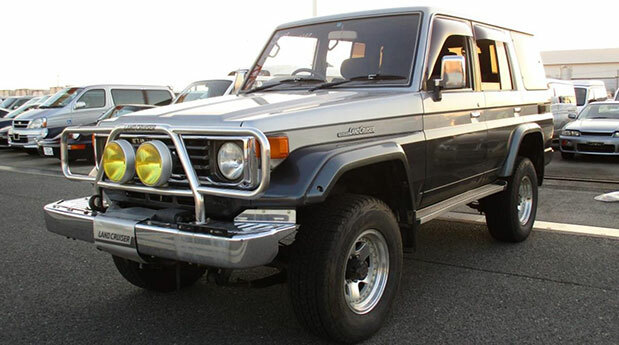 The US spec FJ80 was semi-float and with the introduction of the FZJ80 the full-float was introduced. The easiest way to tell on most applications is the presence of a diff cover. 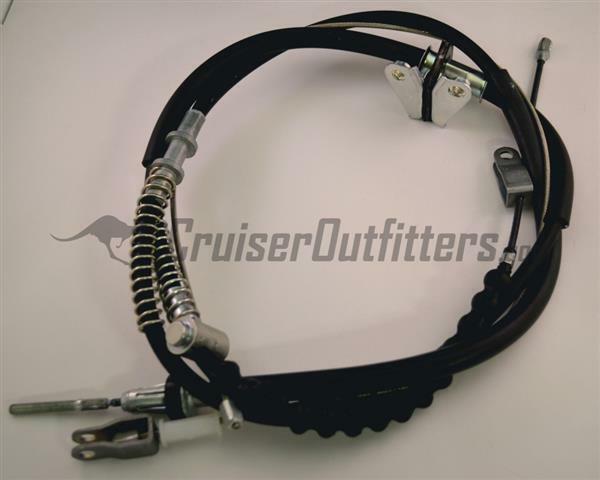 If you have a removable diff cover on the back of your rear axle, you have a semi-float. Clear a mud? 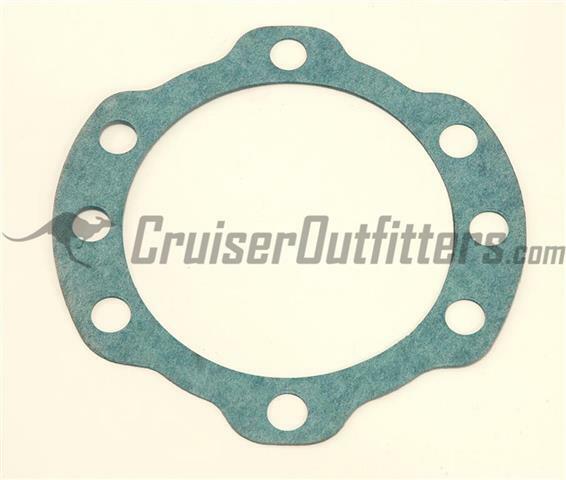 Rear Axle Seal Oil Deflector Gasket - $3.00 ea. One per side required, Semi-Float Axle. One per side required, includes axle race. 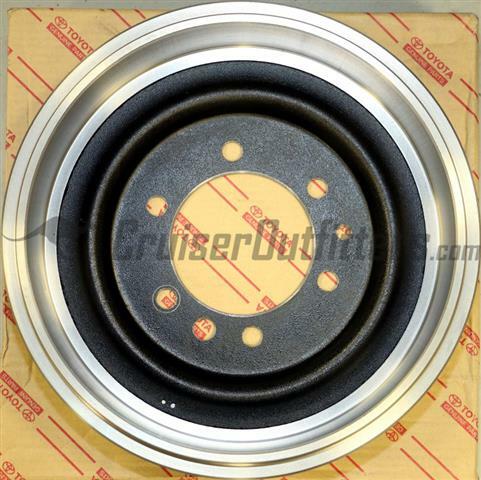 Click here for a full listing of NEW cylinders for your Land Cruiser brake and clutch systems. 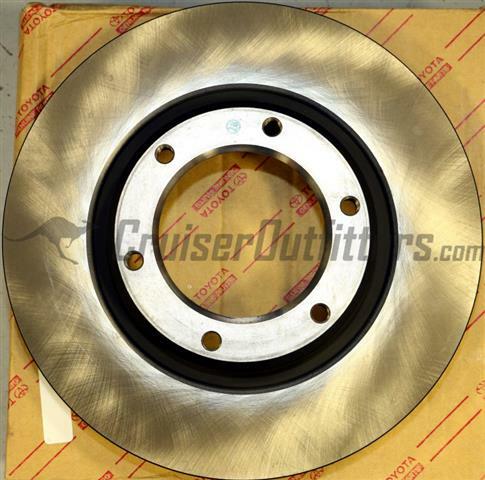 Click here for a full listing of rebuild kits for your Land Cruiser brake and clutch systems. 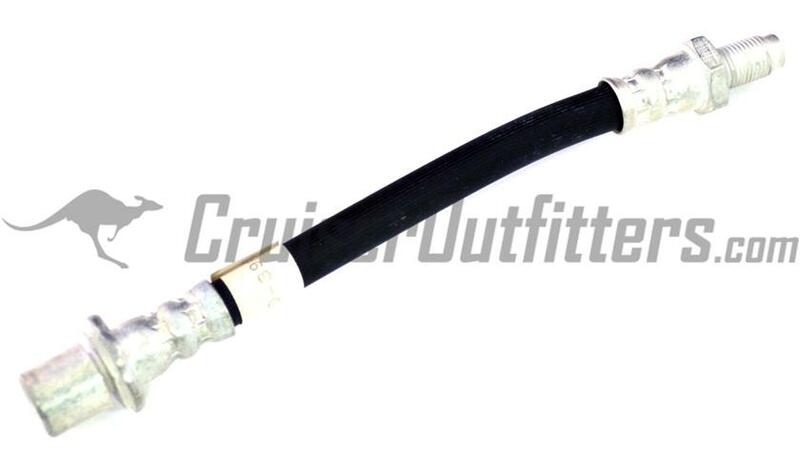 Fits 1/1990-2/1992, includes both Left & Right hoses. 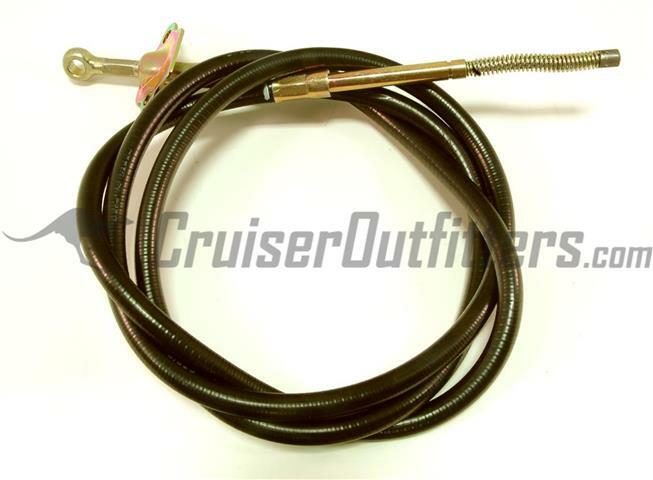 Fits 1/1990 - 12/1994 w/Semi-Float Rear, includes front and rear hoses. 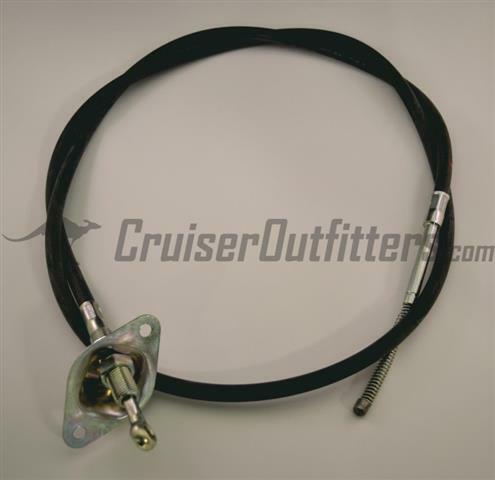 Fits 8/1992-1/1998 w/Full-Float Rear Axle, includes two front and one rear hose. 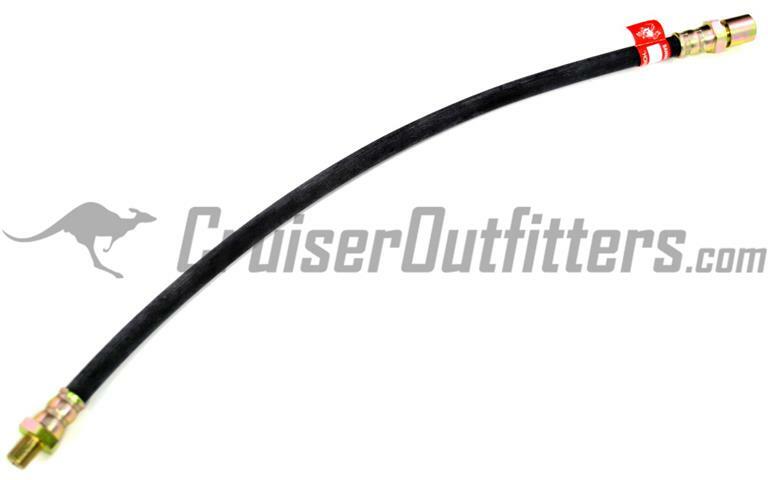 Fits 8/1992-1/1998 Front & Rear Full-Float Rear Axle, includes front and rear hoses. One set per axle. 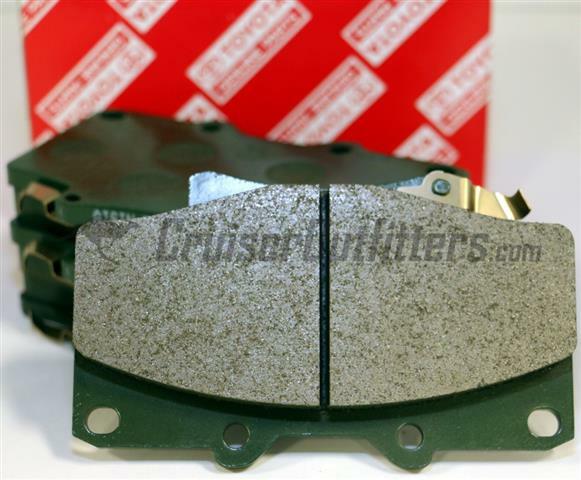 High quality Japanese caliper, pads and hardware kit. 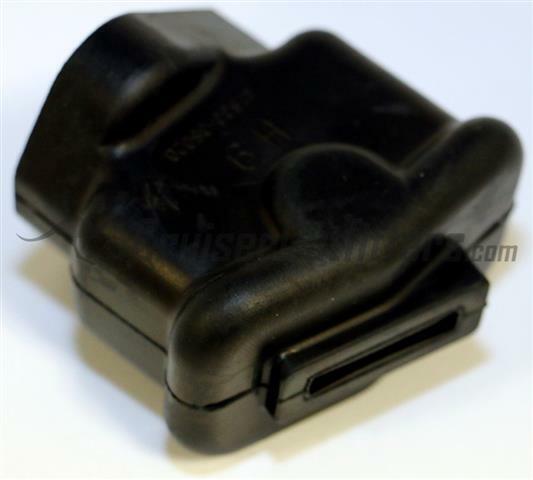 Includes LH & RH caliper (new, not remanufactured), brake pads, 4 pins, 2 pin retainer clips and 2 anti-rattle clips. 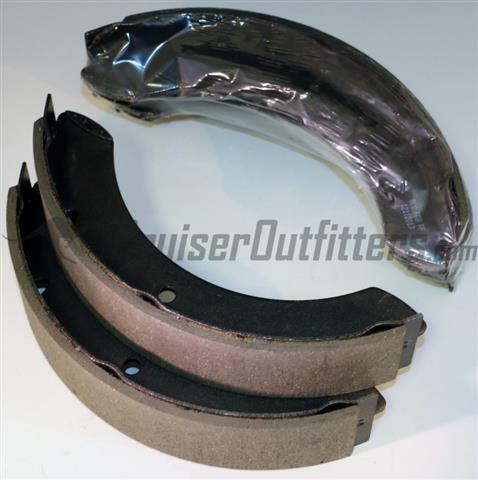 Front/Rear Brake Shoes 63'-80' - $42.50 ea. 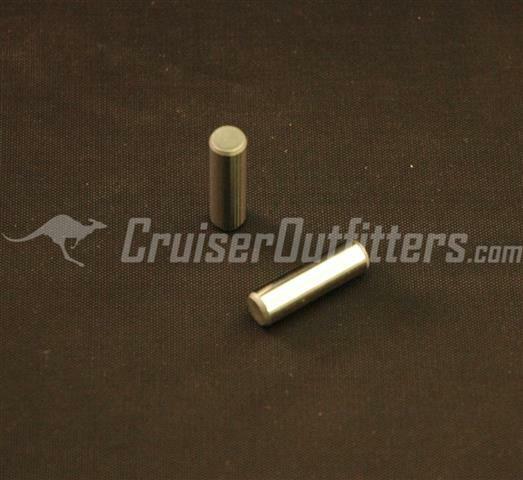 One set per axle, no core charge. Fits front and rear. 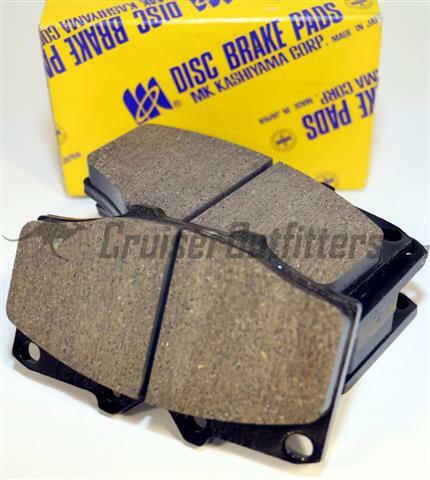 Rear Brake Shoes 80'-94' - $42.50 ea. 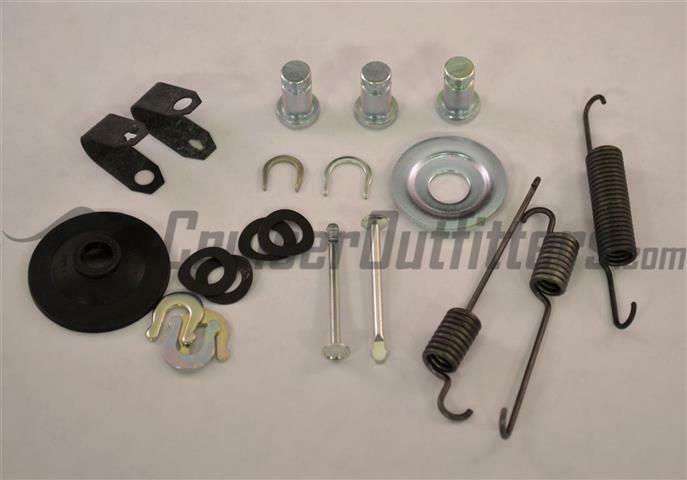 Front/Rear Brake Hardware Kit 63'-80' - $22.50 ea. 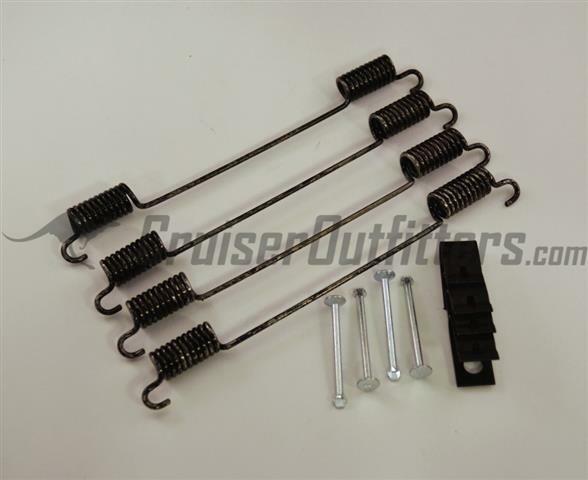 Rear Brake Hardware Kit 80'-90' - $24.50 ea. One kit per axle required. 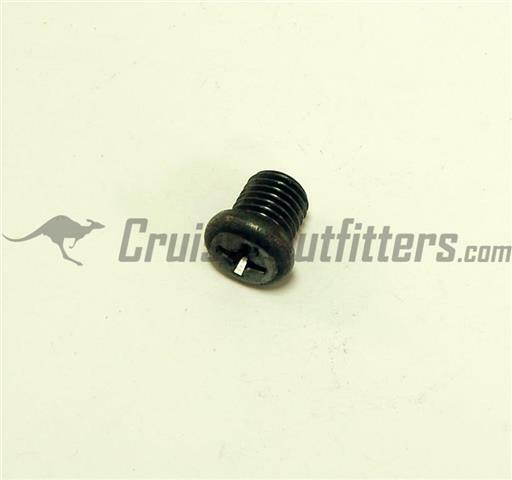 Brake Drum Retaining Screw - $1.00 ea. 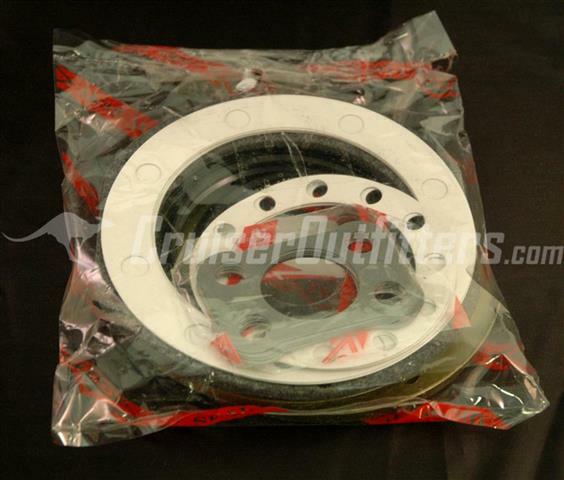 One required per brake drum, 2 per axle. 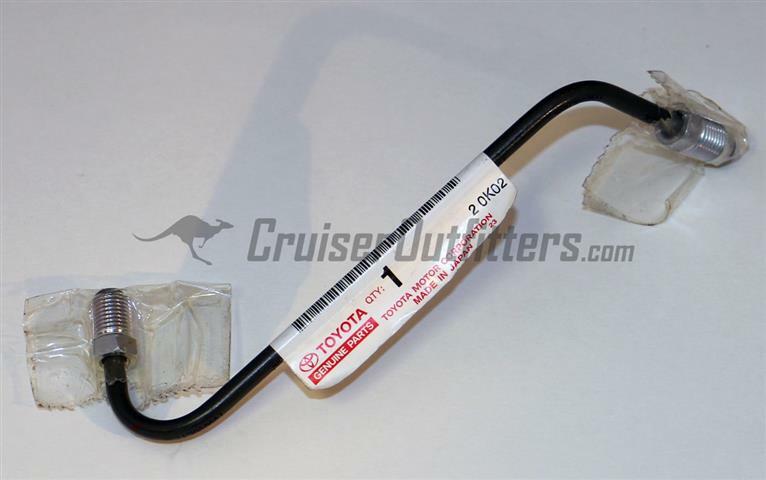 OEM Toyota, includes additional hardware & components. Requires one per side, 2 per axle. 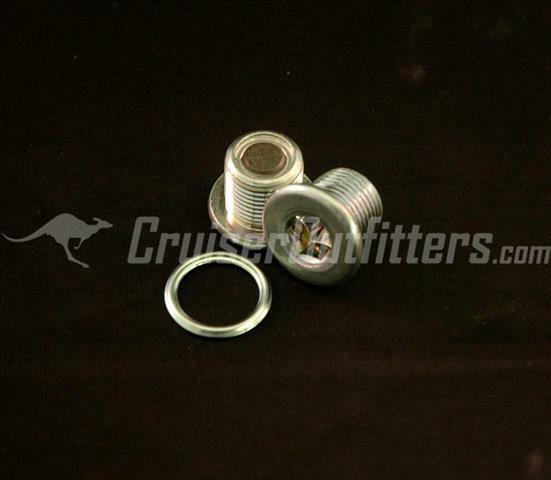 Looking for Wheels, Wheel Spacers, Wheel Studs, Lug Studs & Lug Nuts?